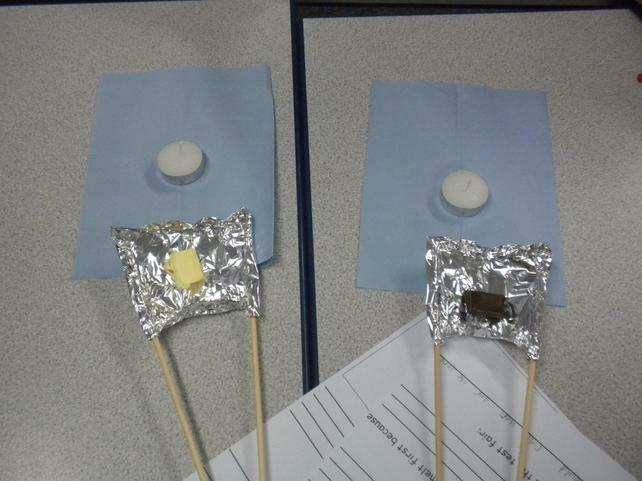 Can I make a test fair? 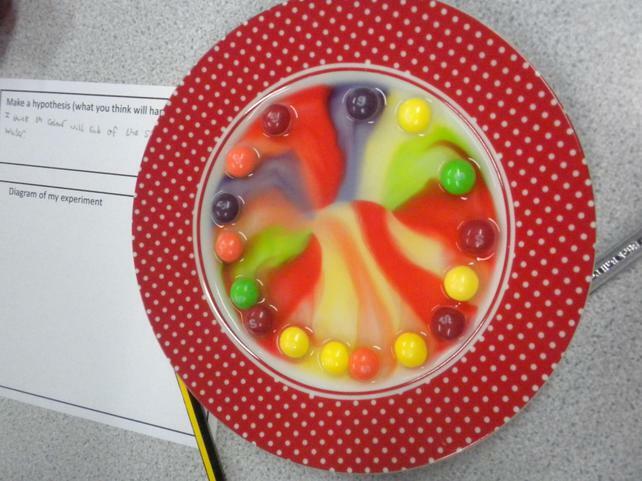 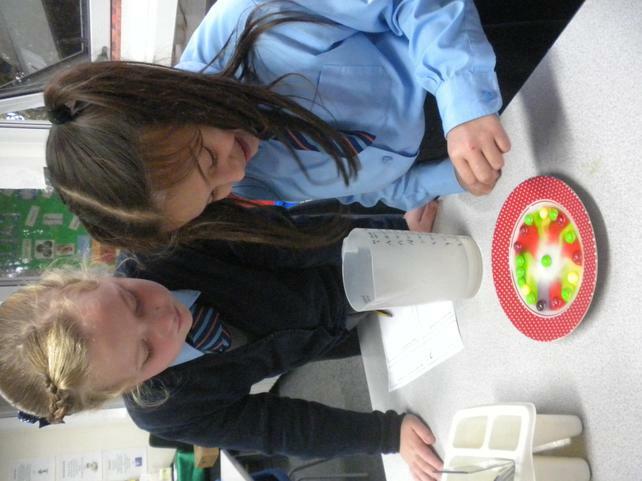 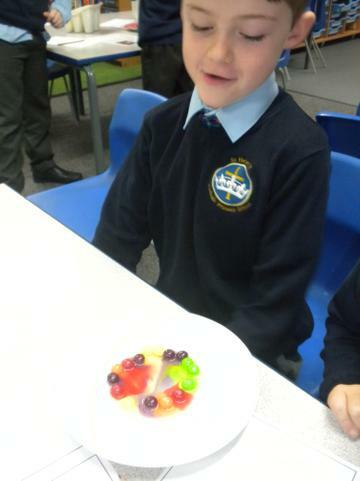 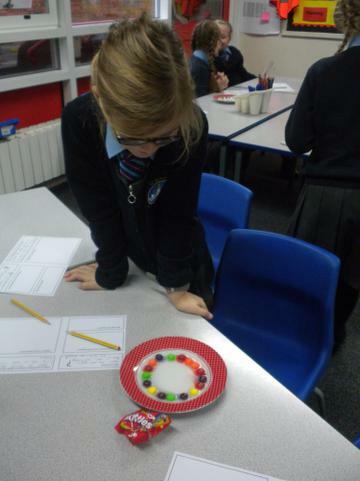 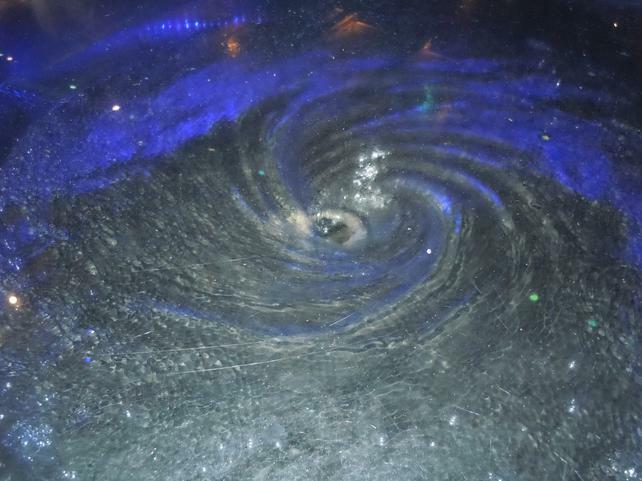 Can I plan an experiment and follow a line of enquiry? 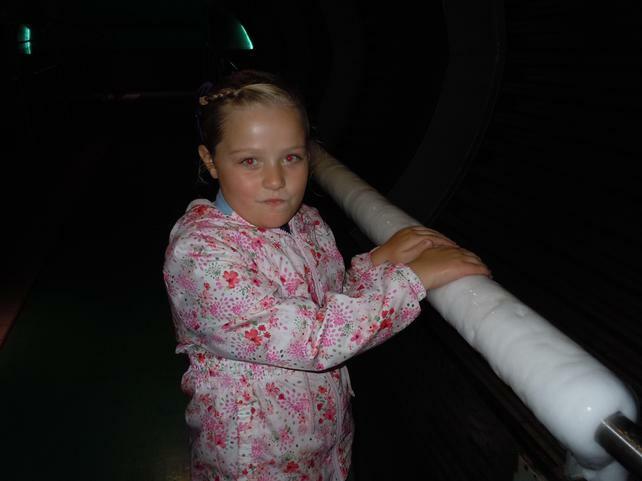 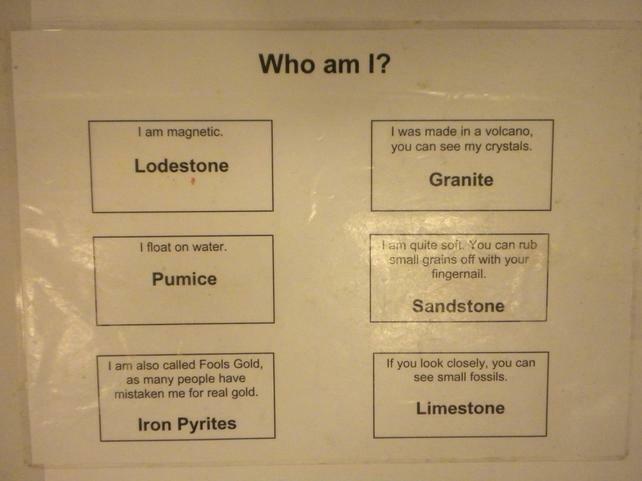 What is air and does it weigh anything? 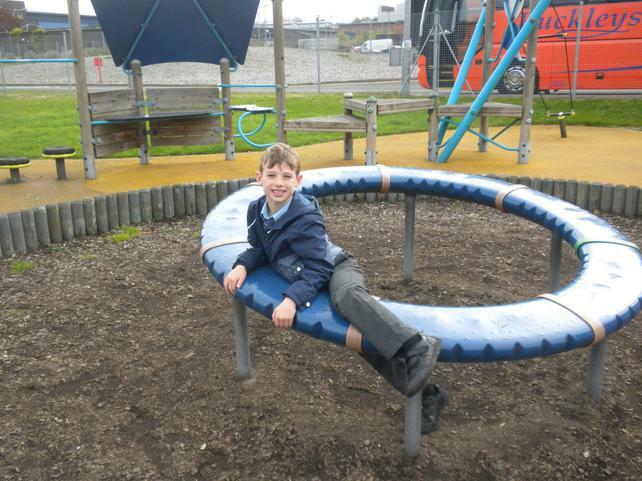 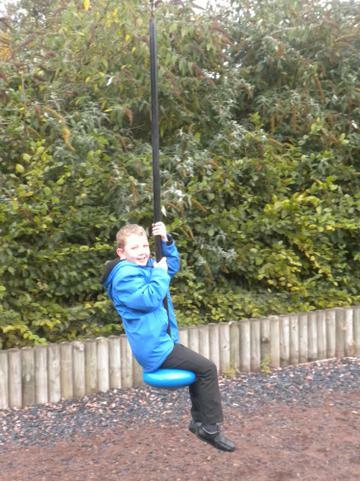 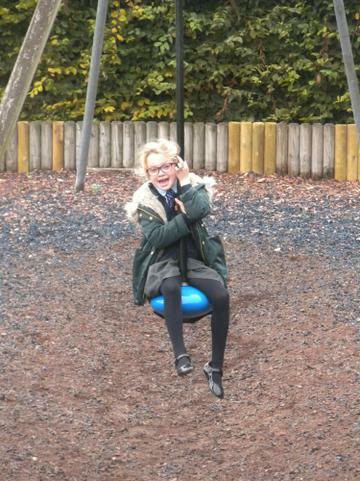 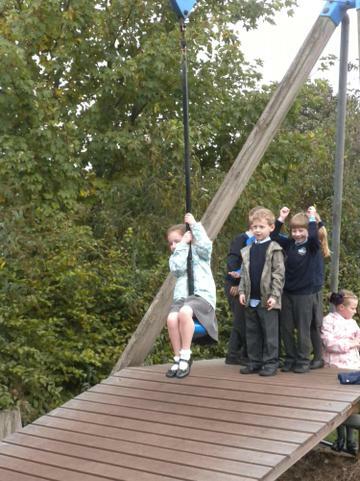 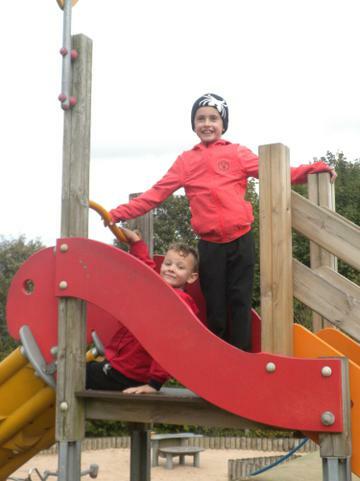 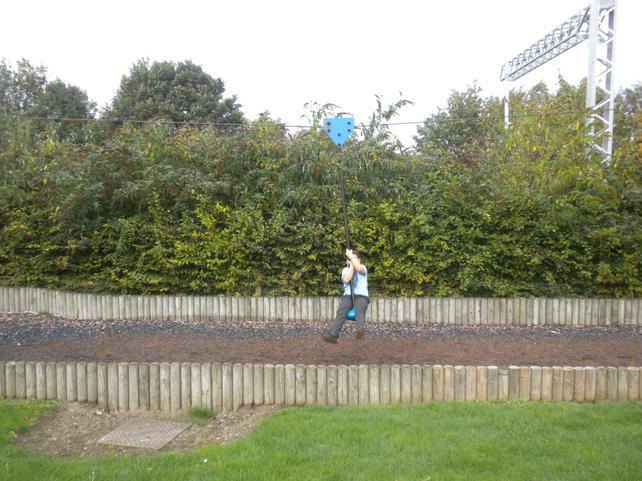 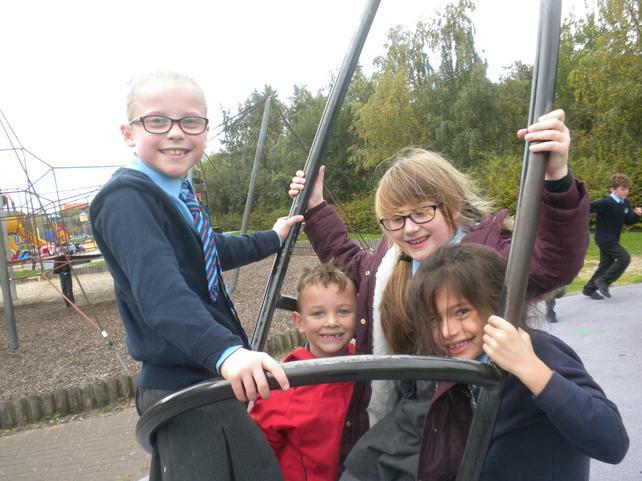 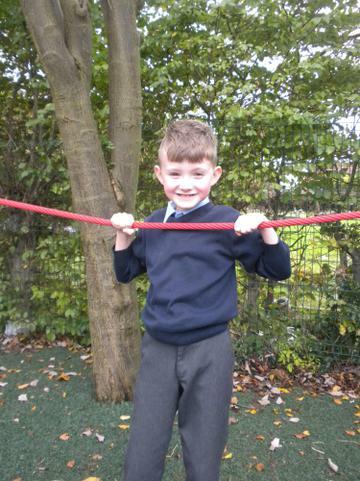 We are so very proud to have the attendance of the week this week and we have had extra play time to celebrate! 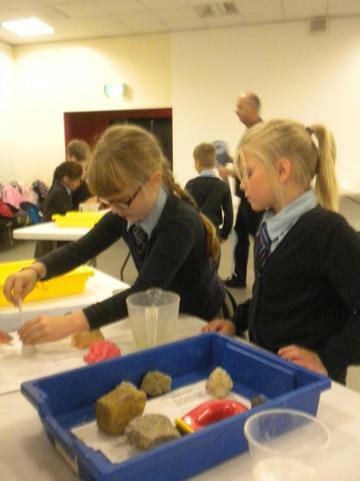 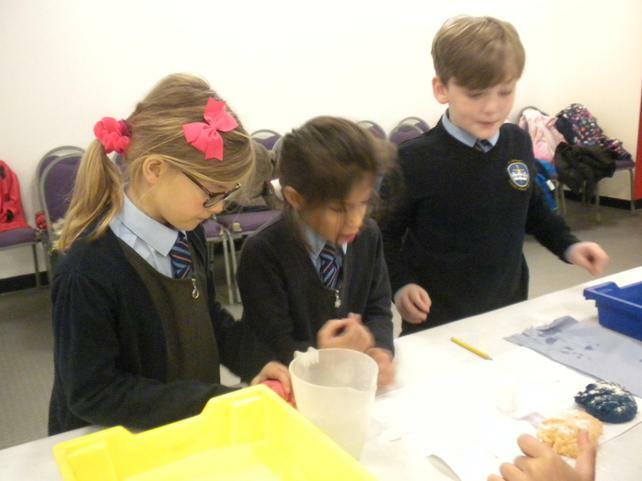 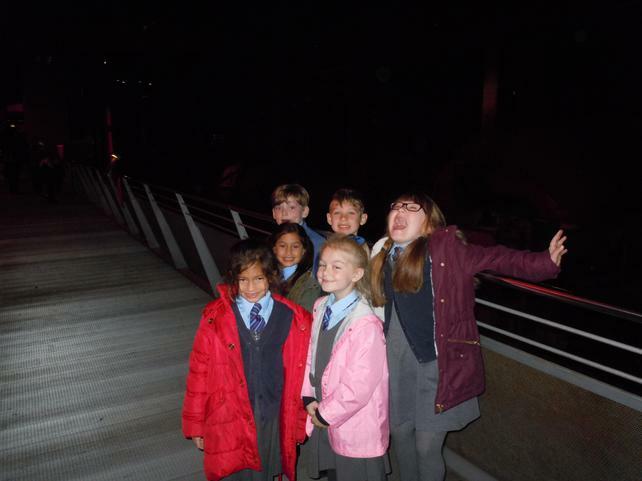 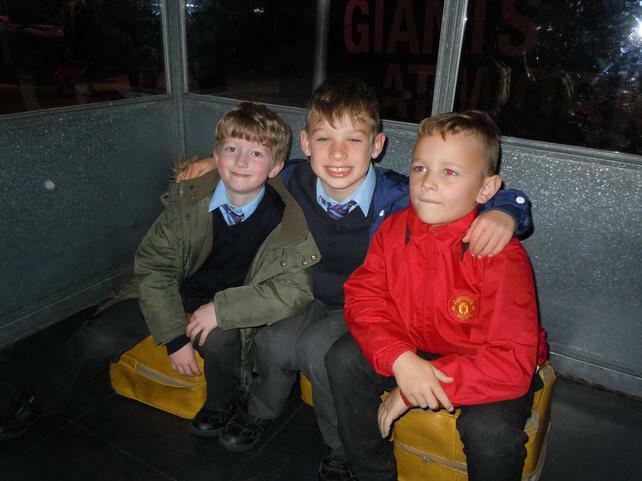 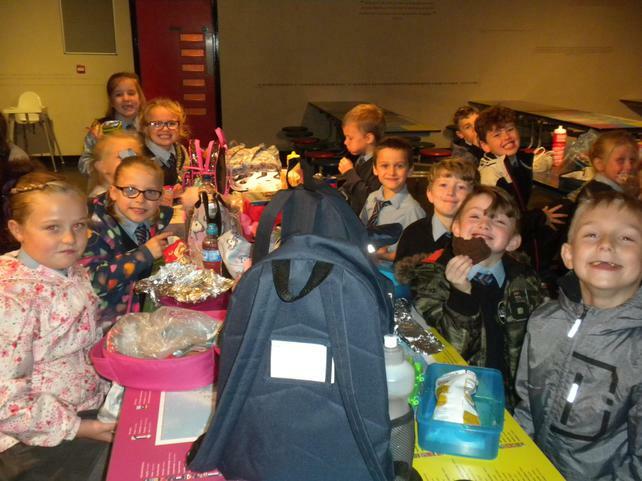 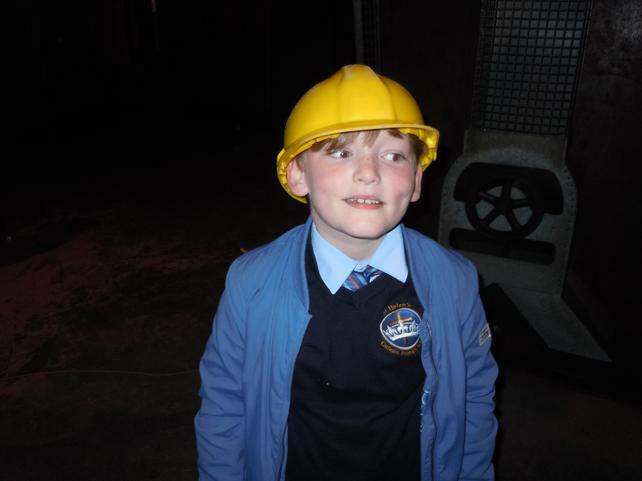 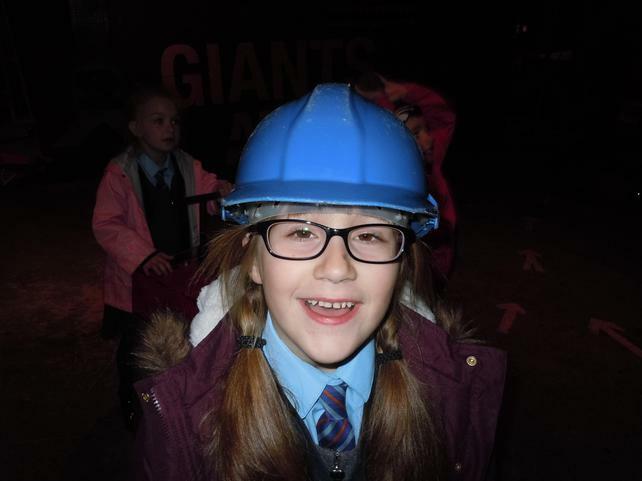 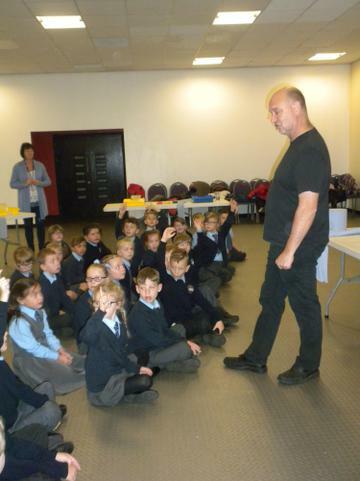 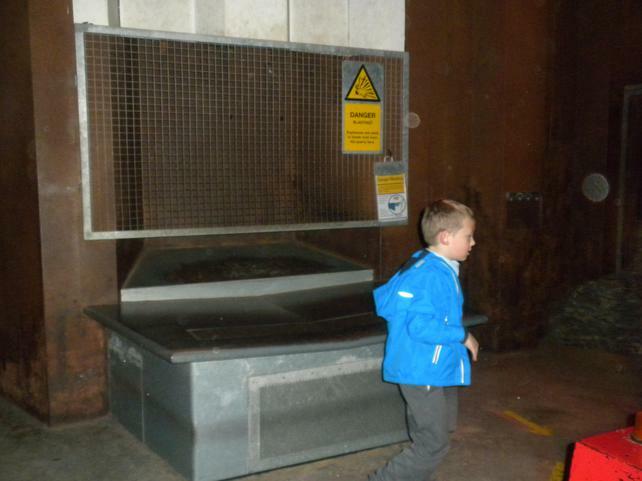 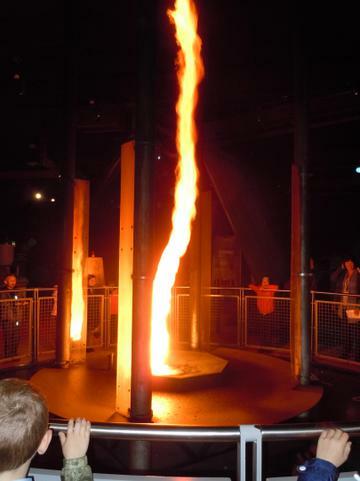 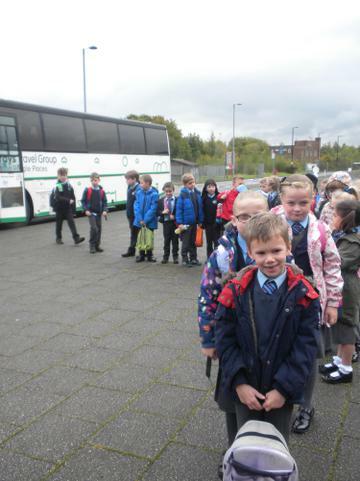 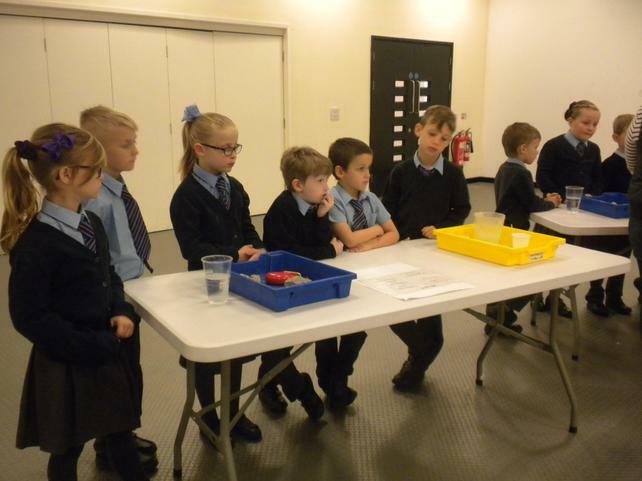 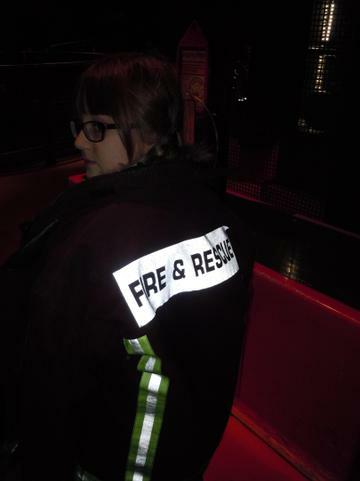 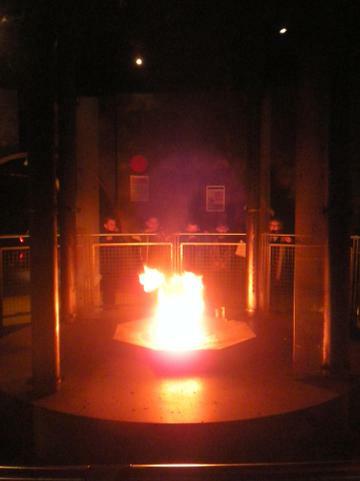 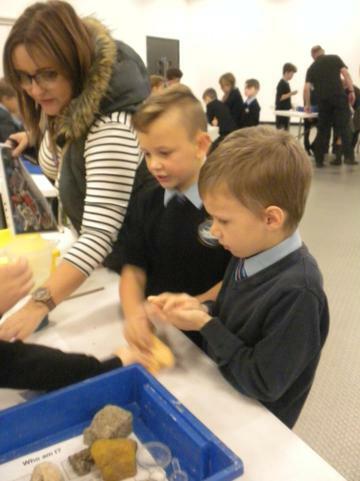 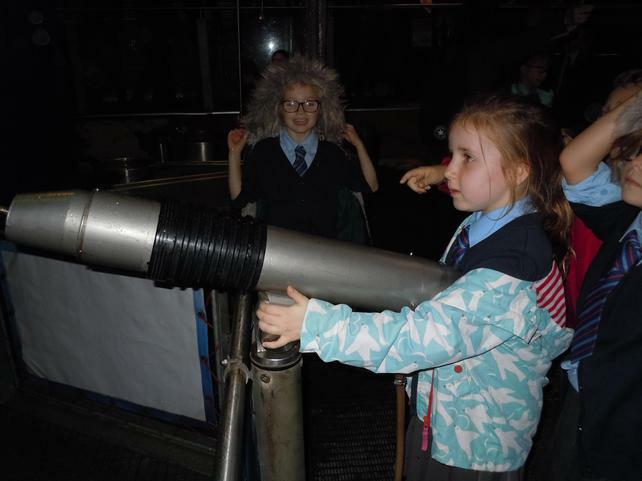 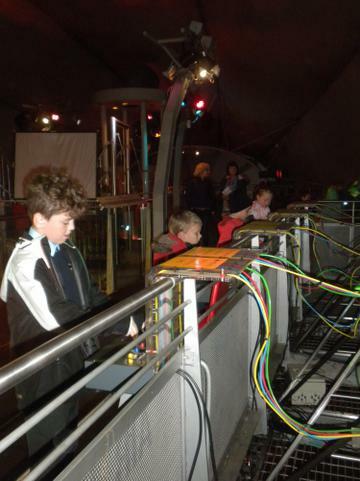 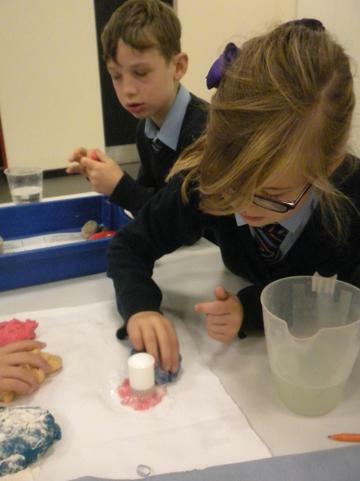 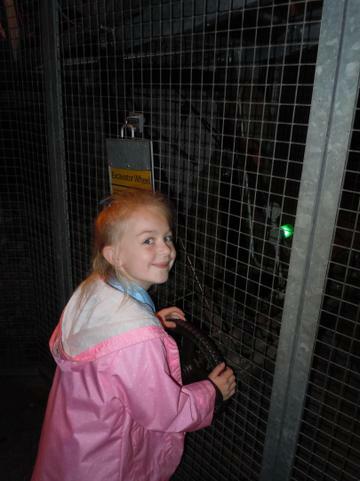 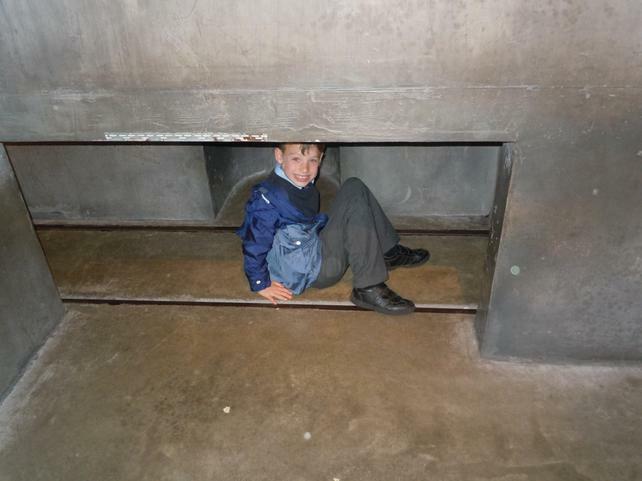 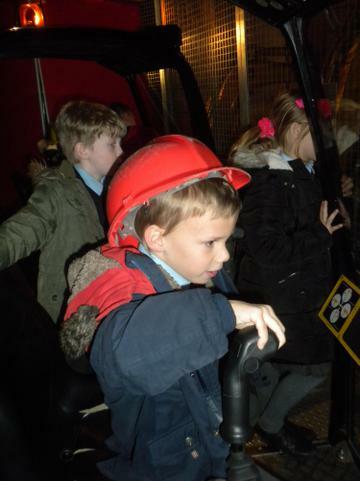 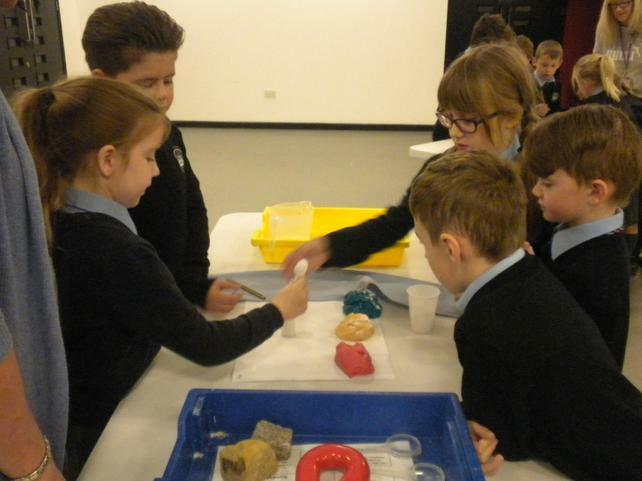 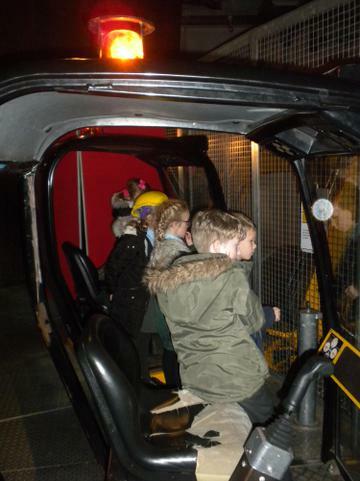 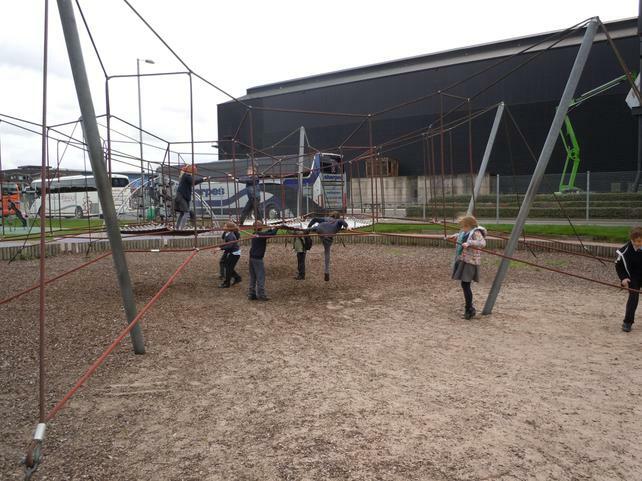 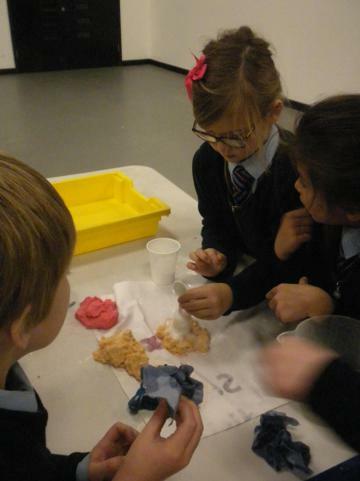 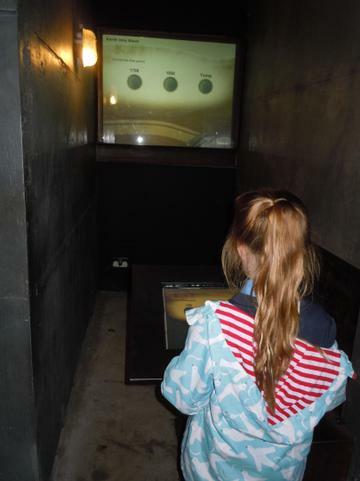 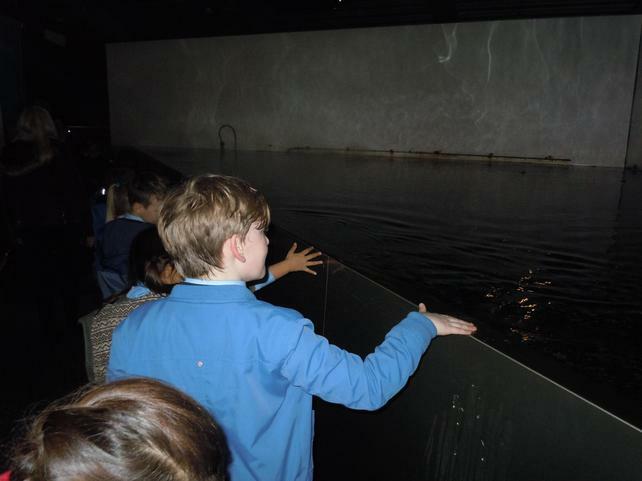 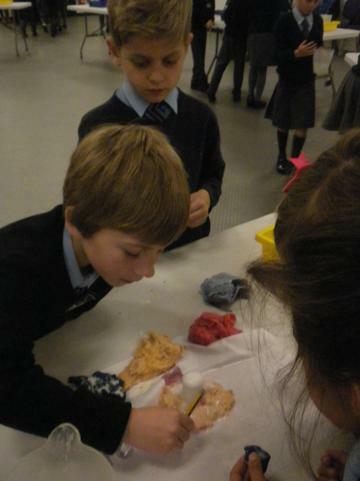 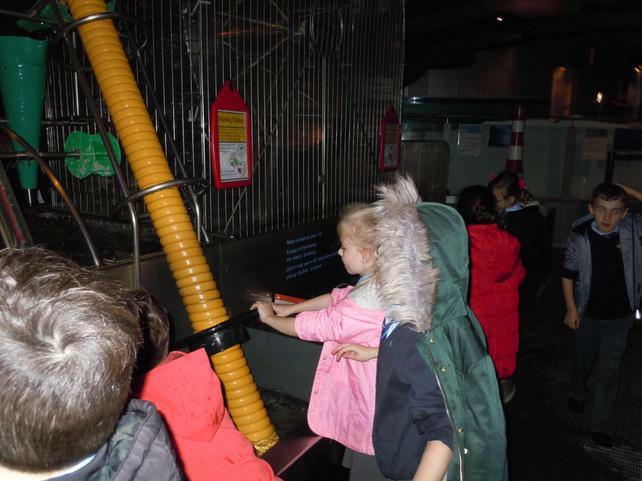 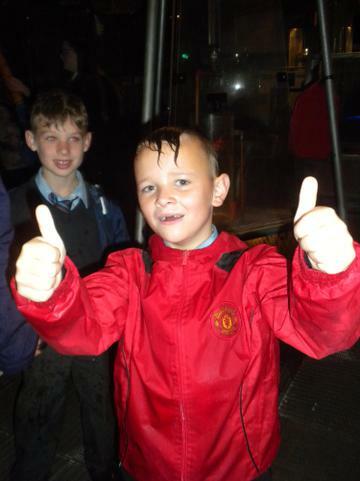 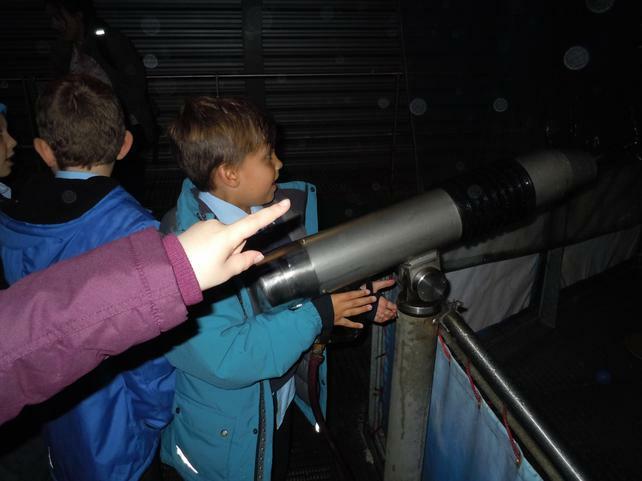 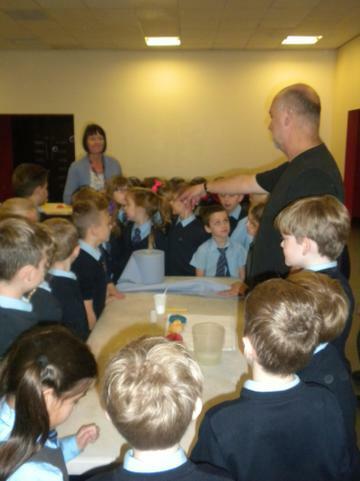 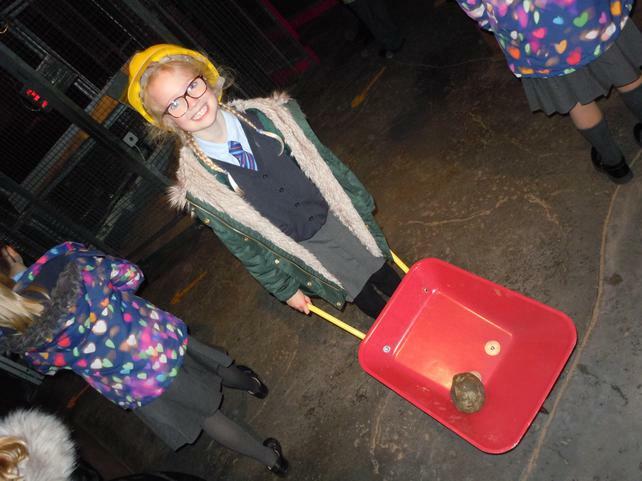 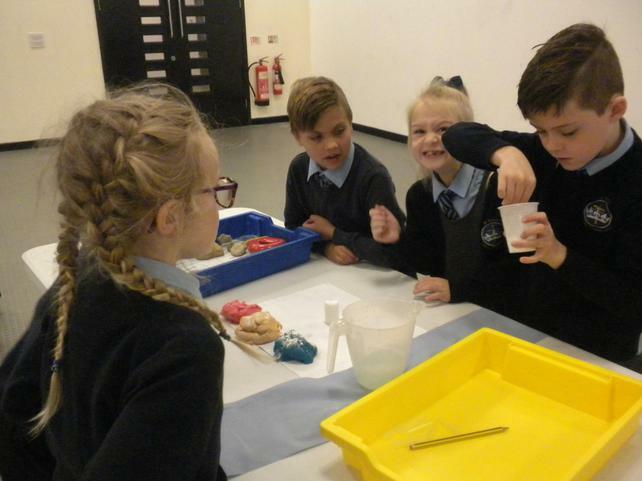 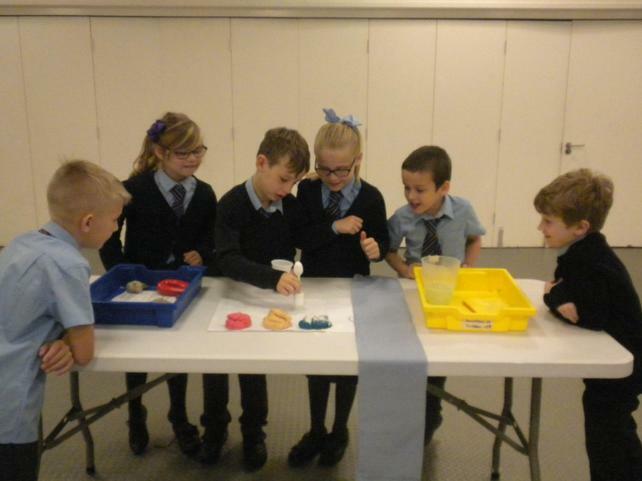 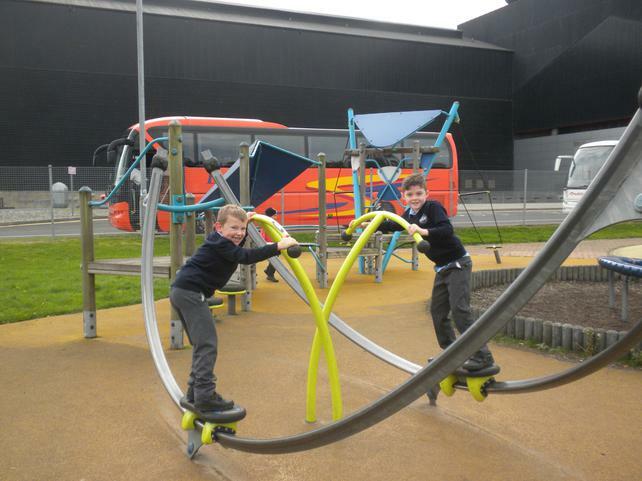 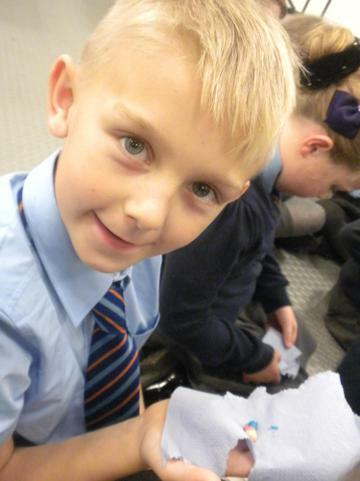 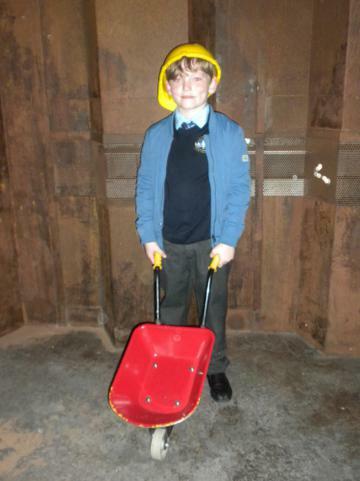 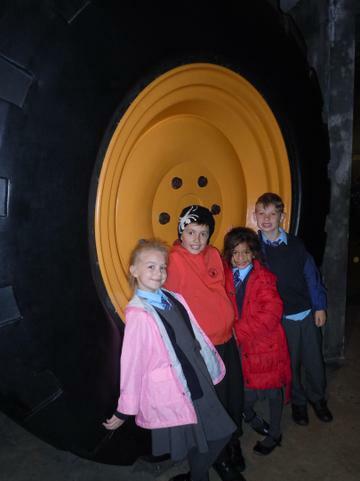 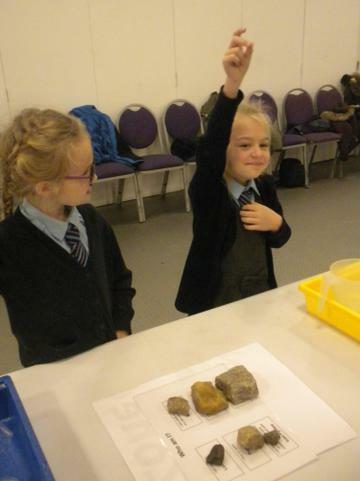 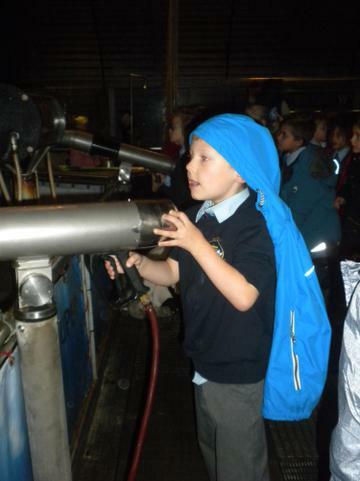 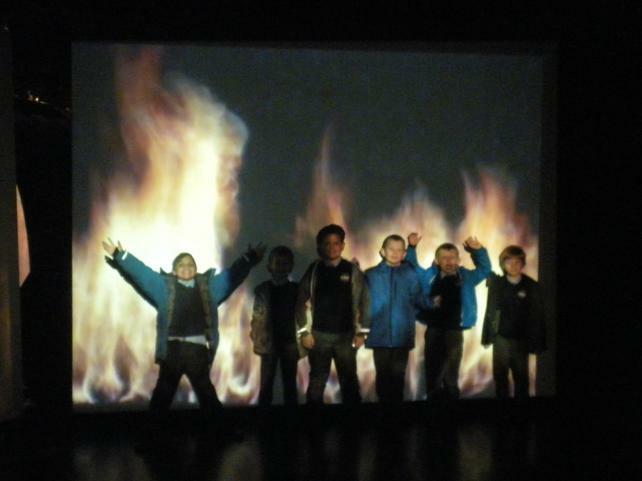 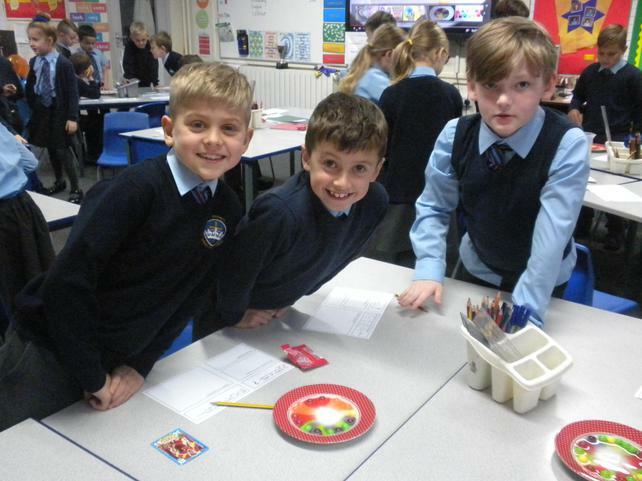 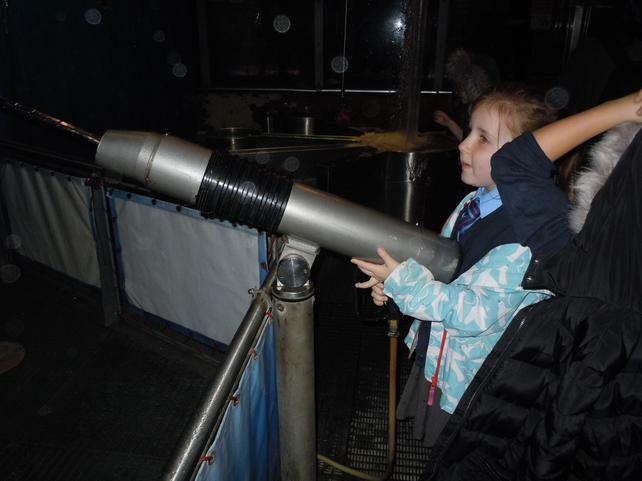 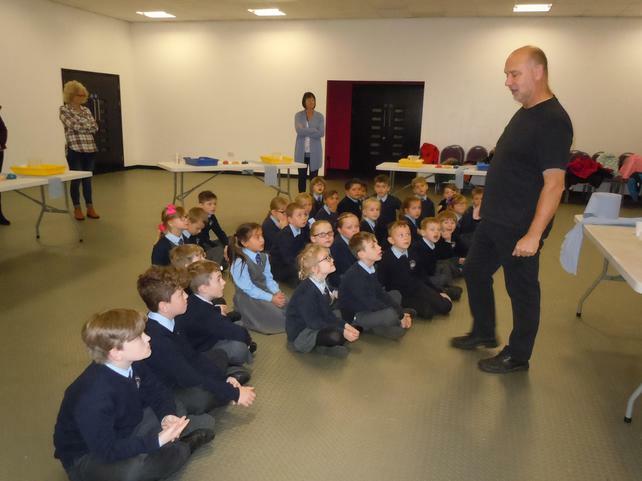 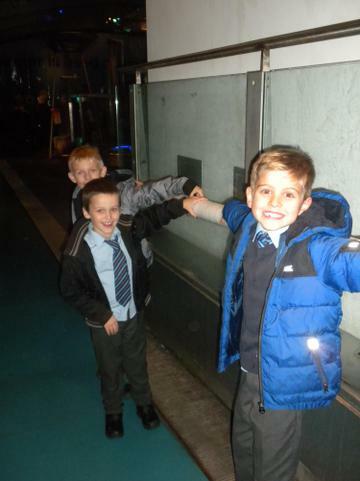 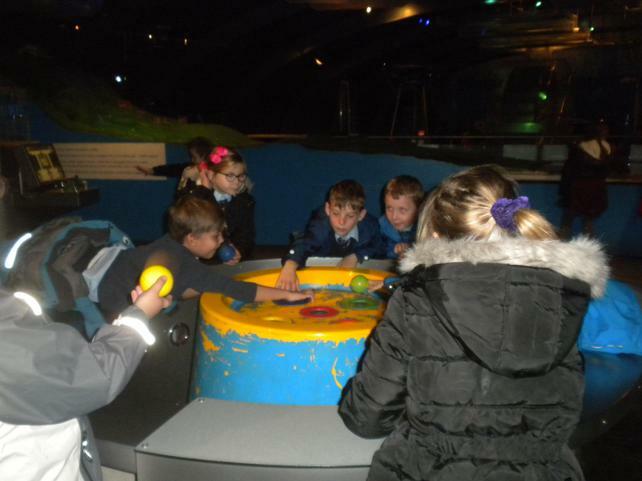 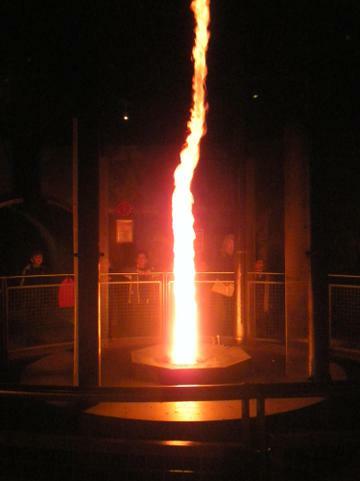 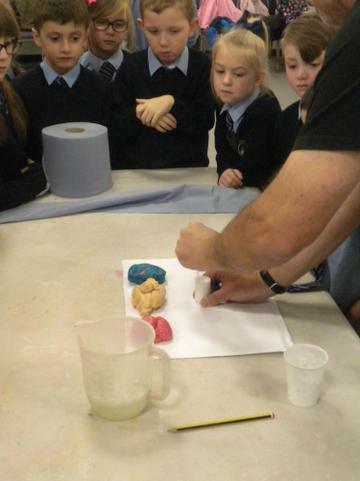 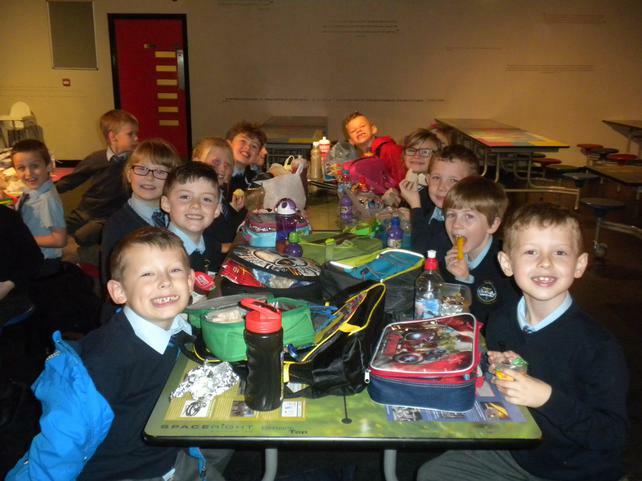 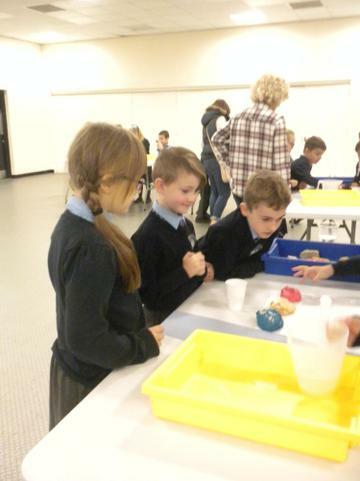 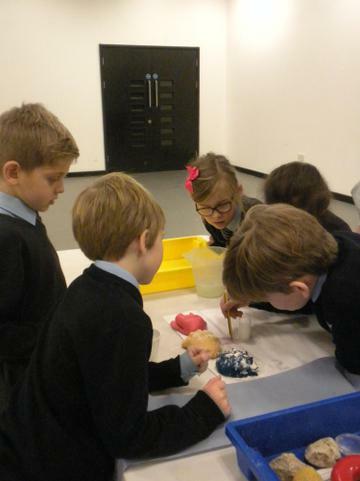 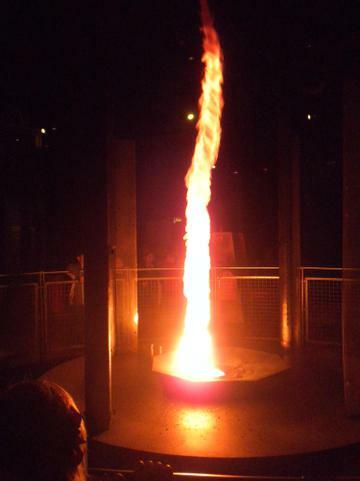 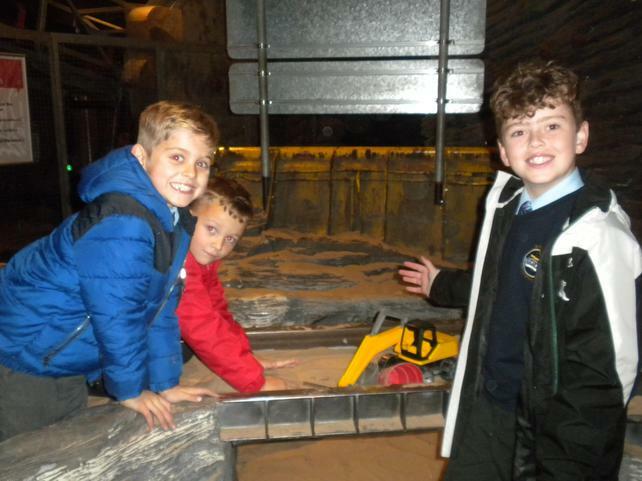 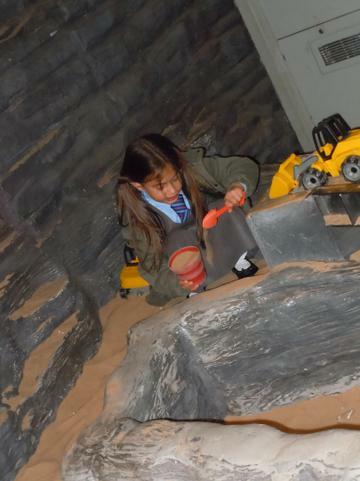 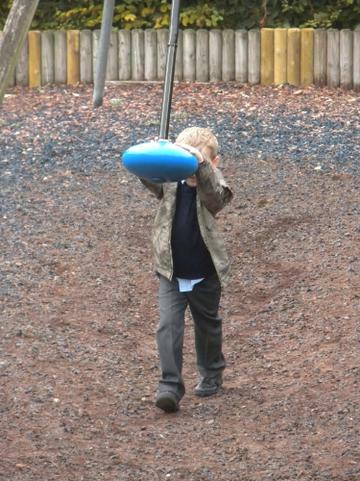 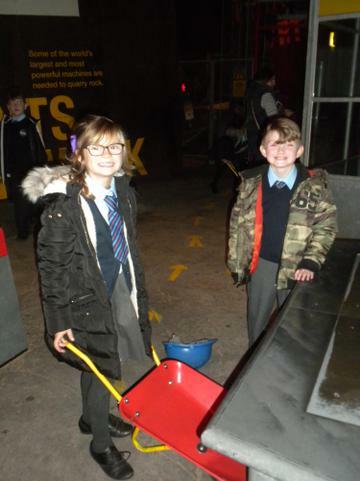 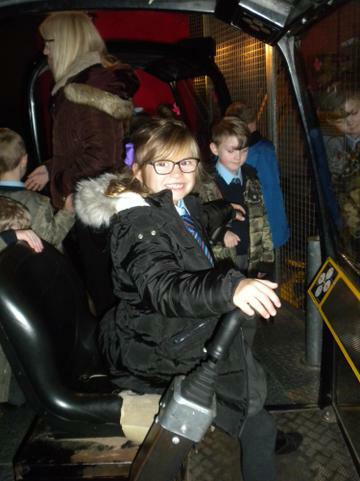 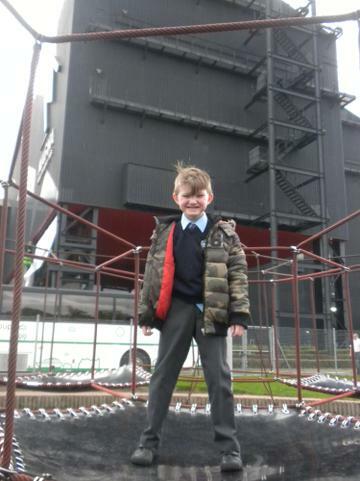 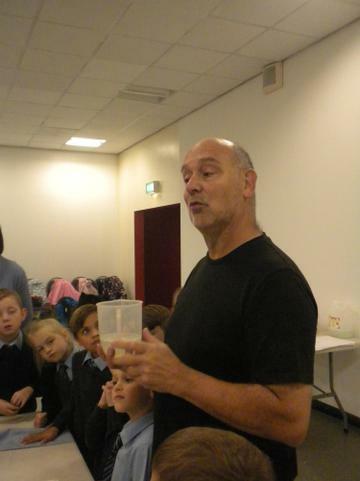 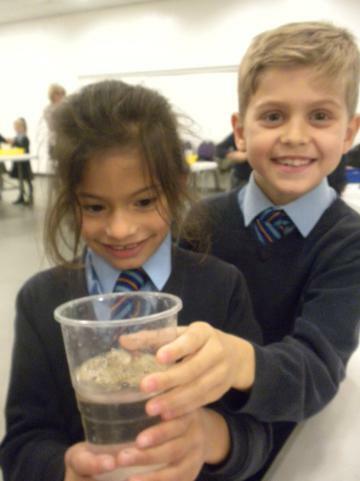 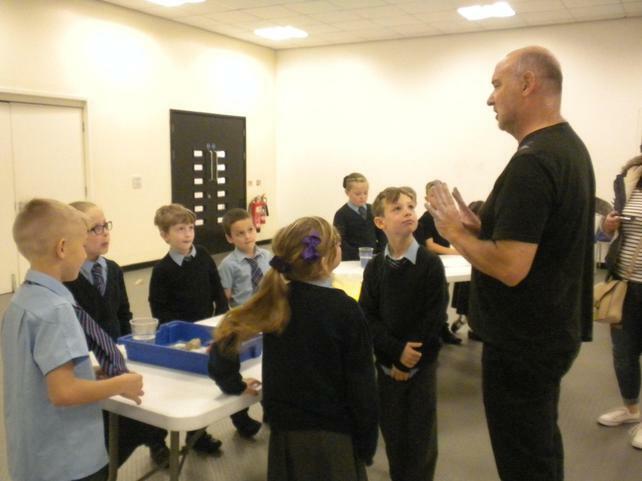 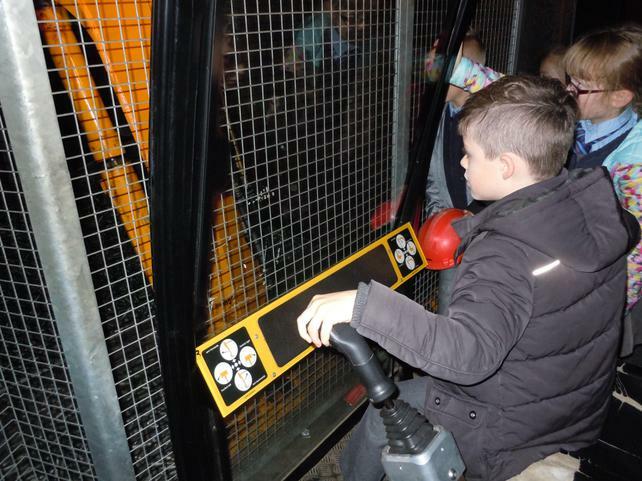 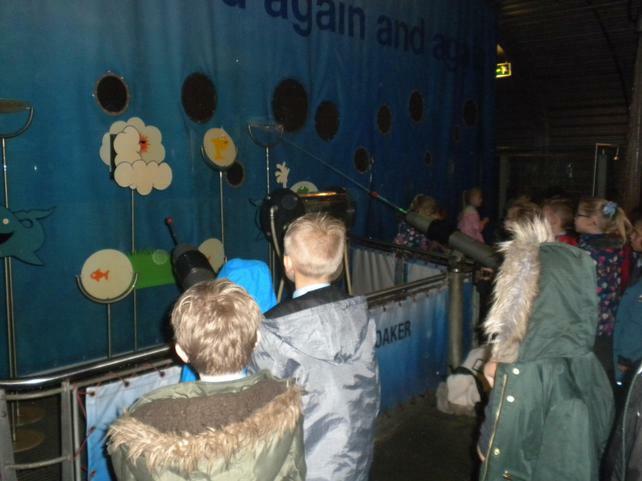 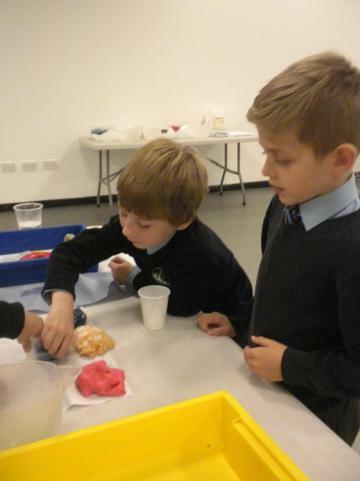 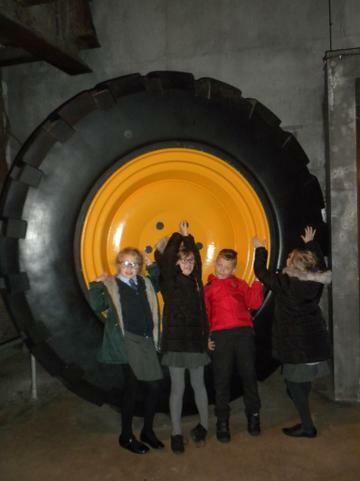 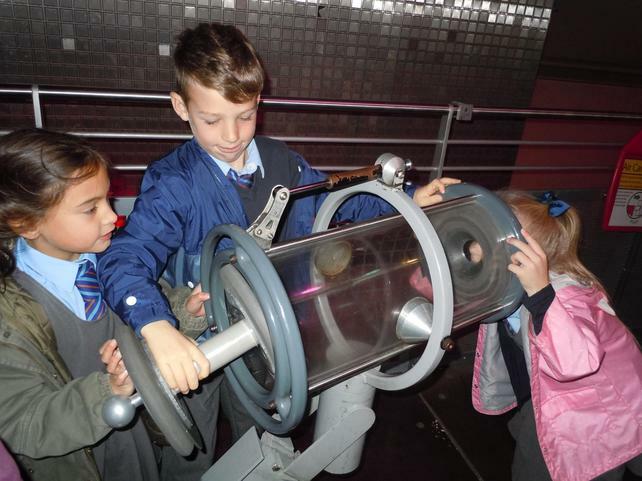 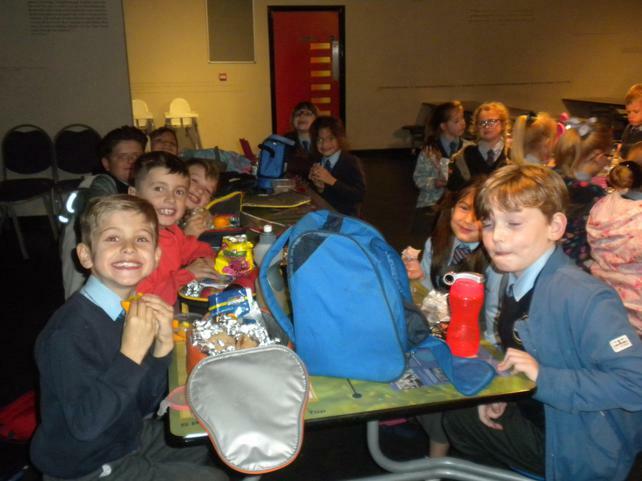 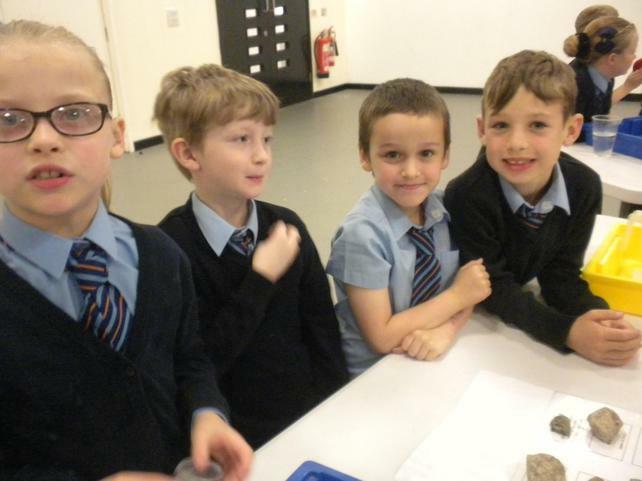 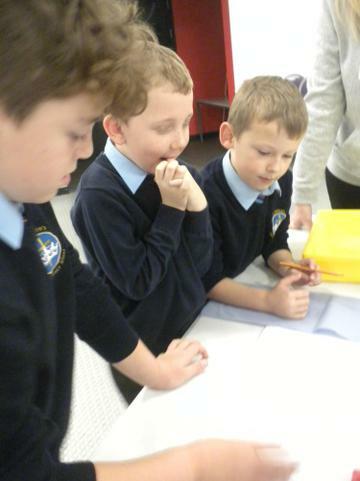 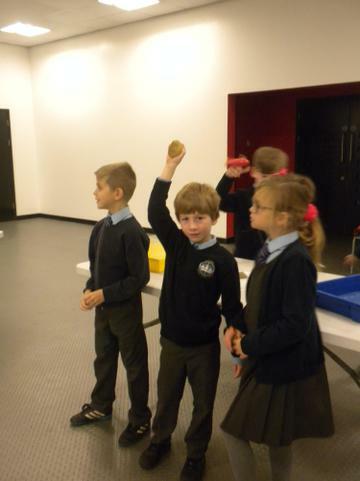 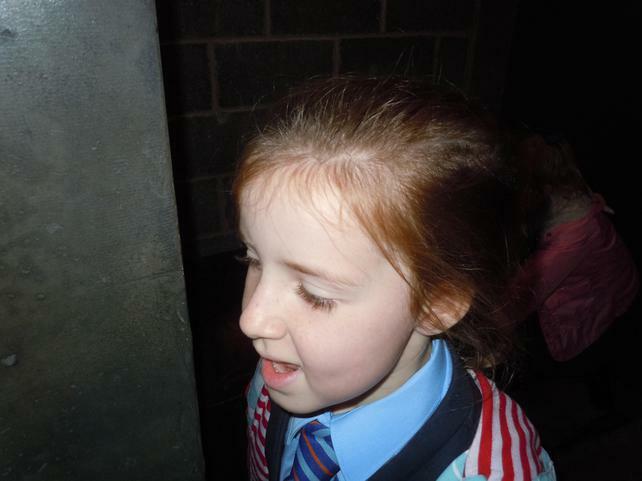 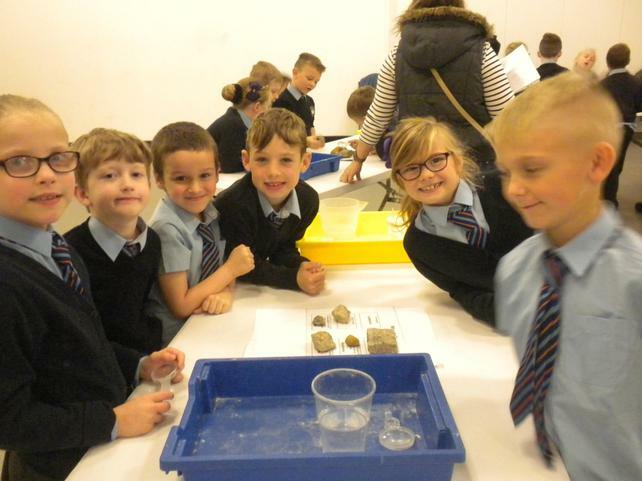 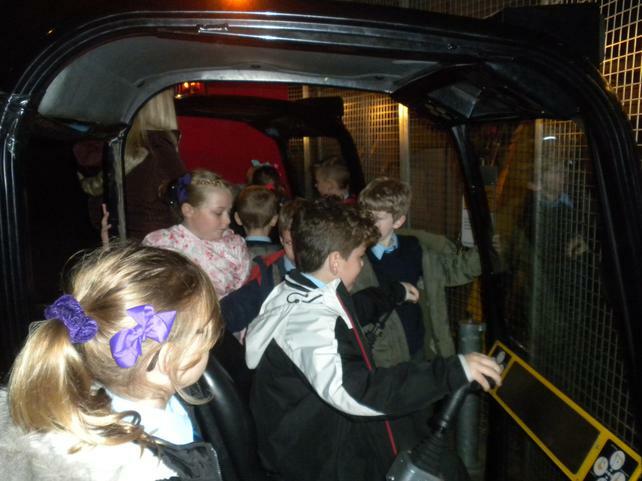 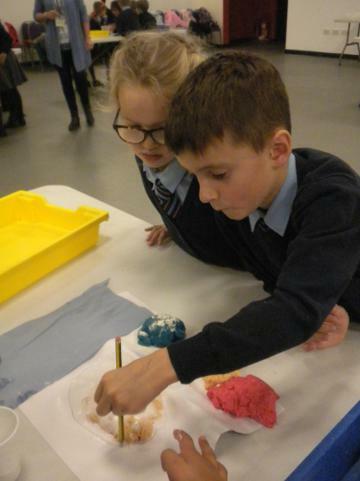 We all had a fantastic day at Magna and learnt some amazing facts about volcanoes and rocks. 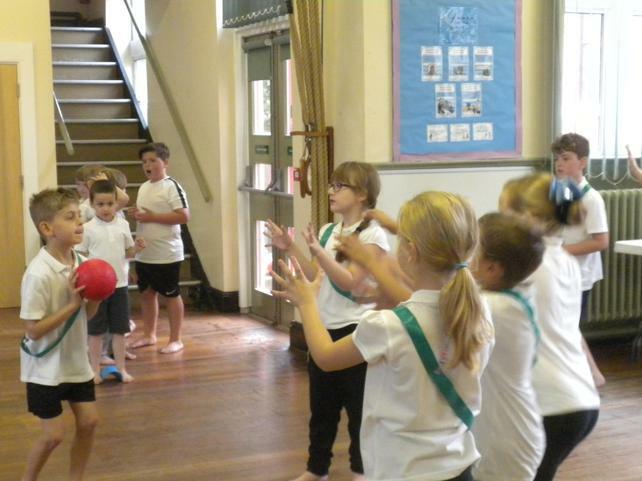 We thought you might like to hear our rendition of 'Wild Thing' which we have be learning to play in ukulele. 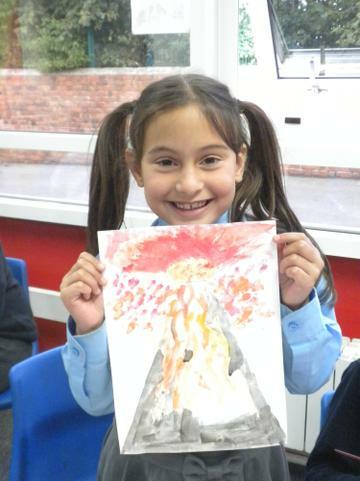 This week we have begun planning our stories about escaping from Pompeii. 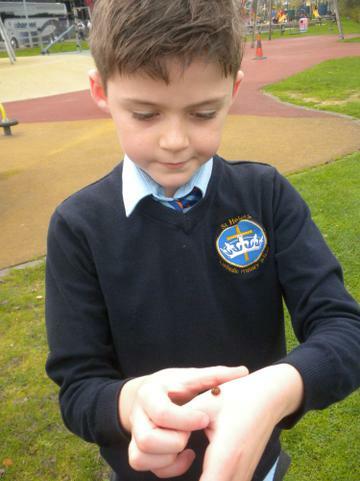 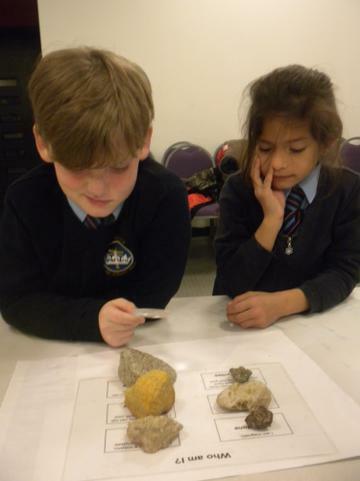 We have also researched about the different types of animals that would be found living near volcanoes. 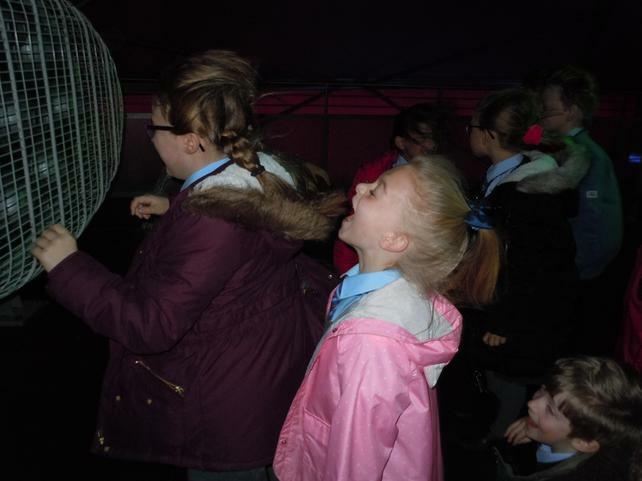 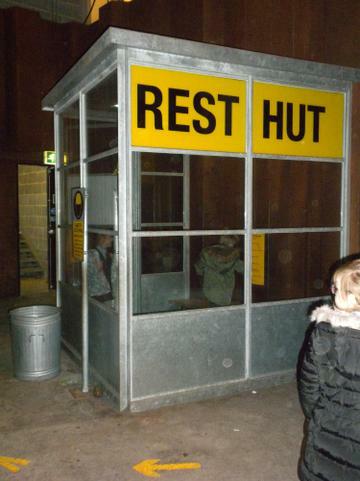 There were some very funny names which made everyone laugh! 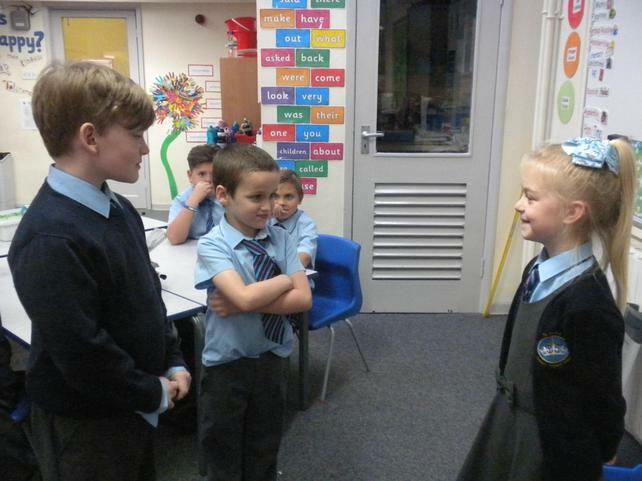 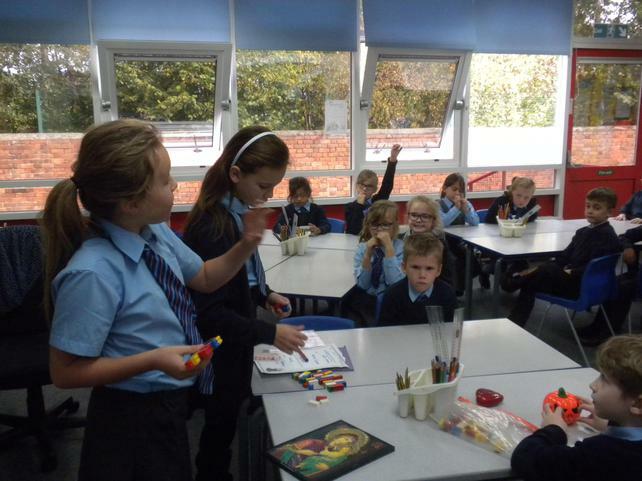 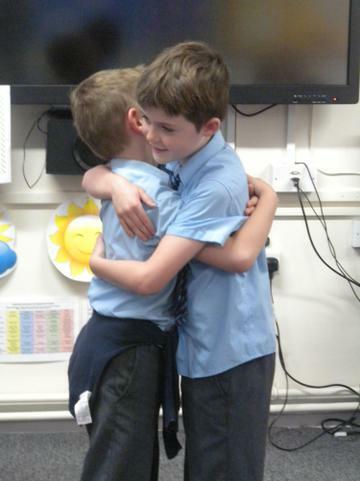 Finally we were lucky to have two children from class 4 come into our class to show us a special worship. 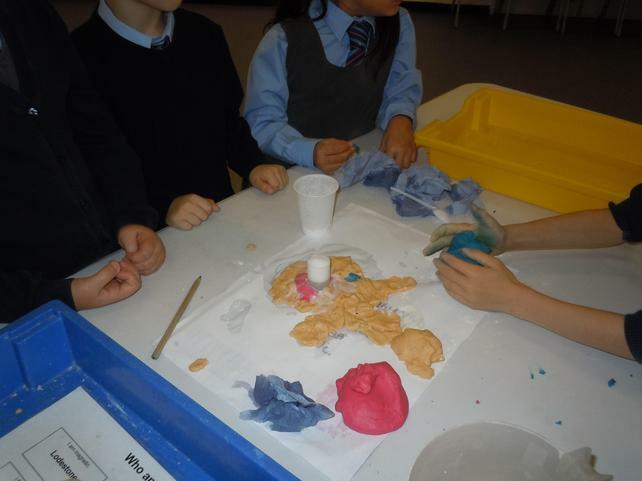 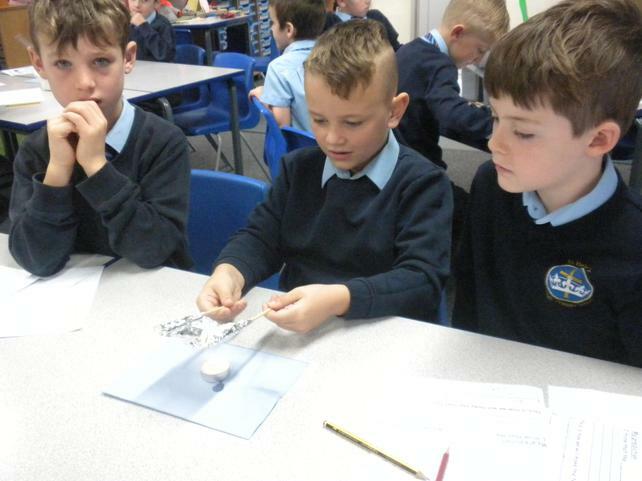 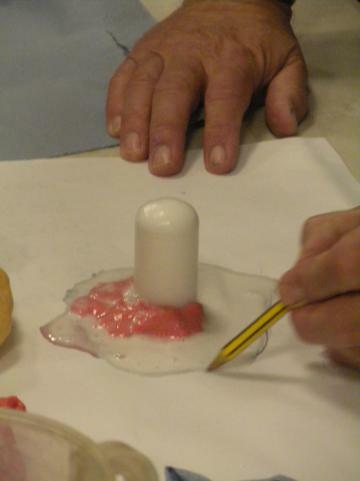 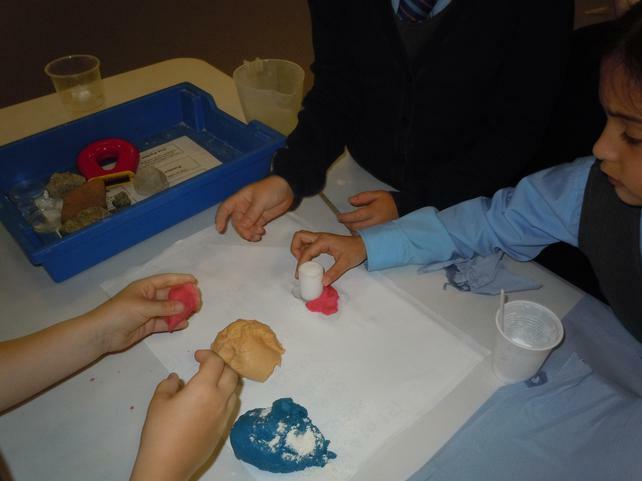 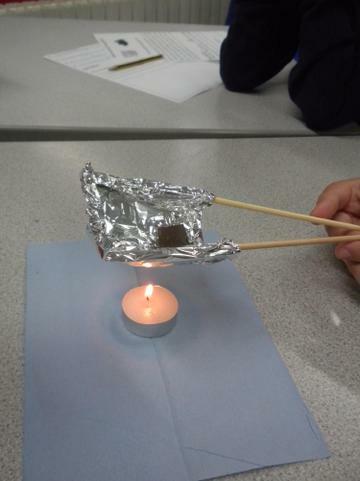 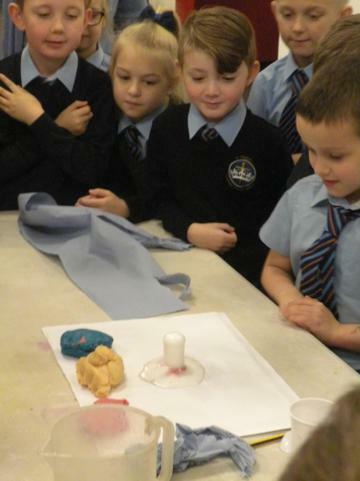 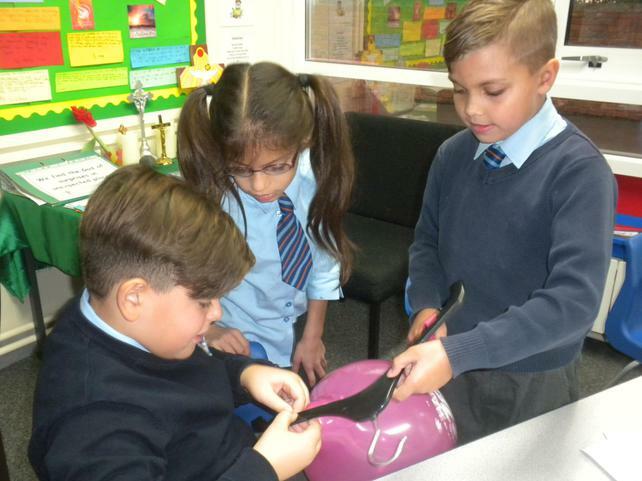 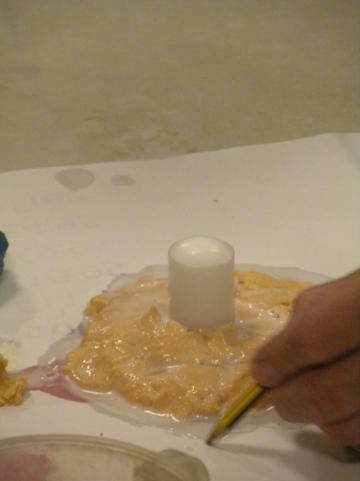 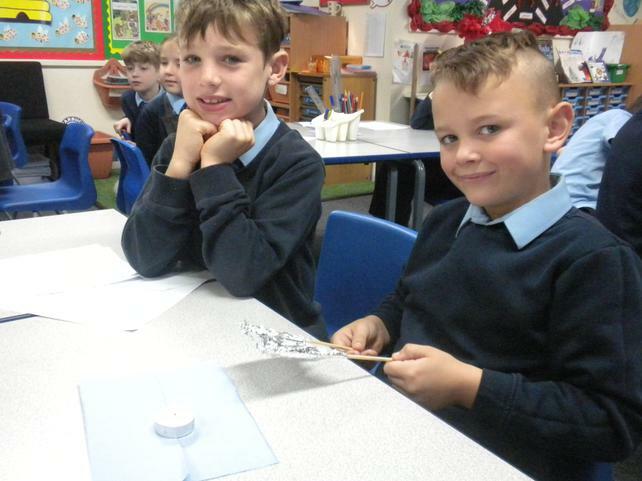 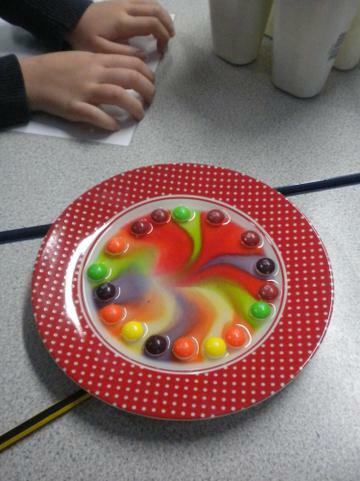 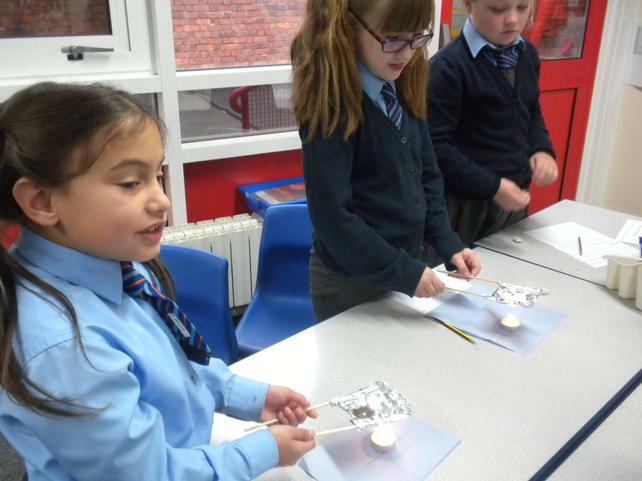 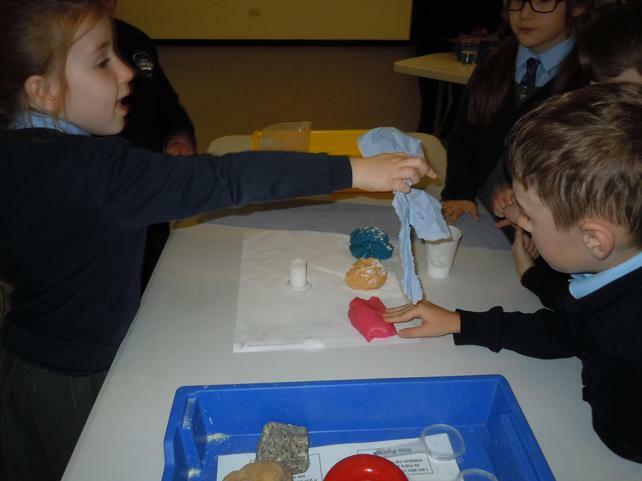 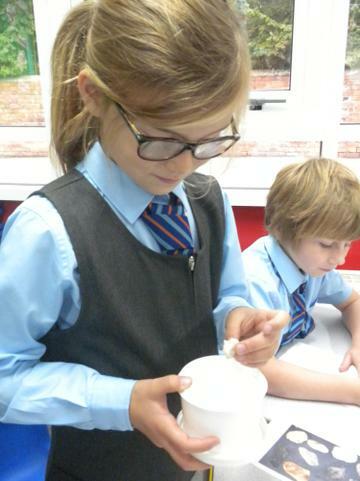 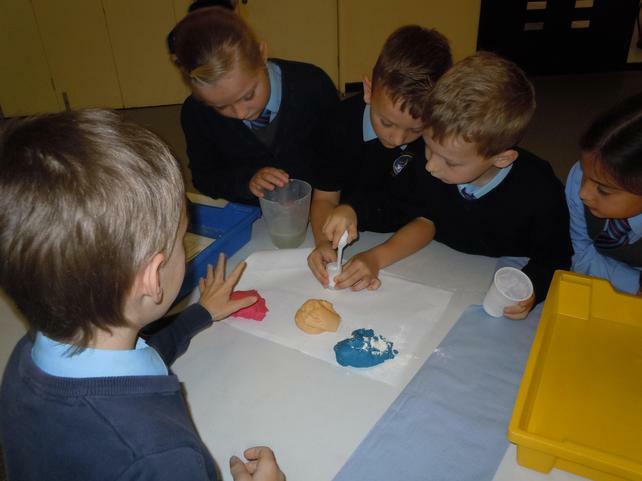 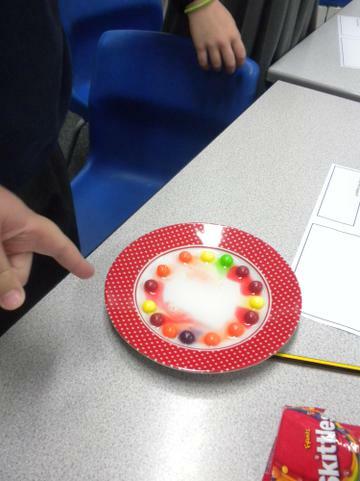 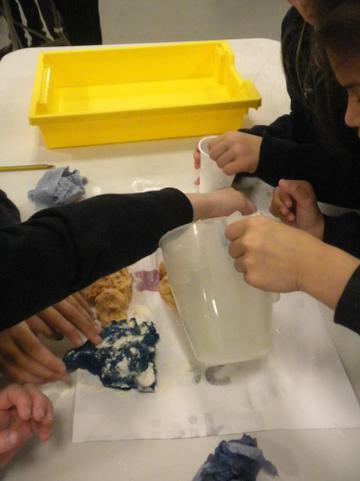 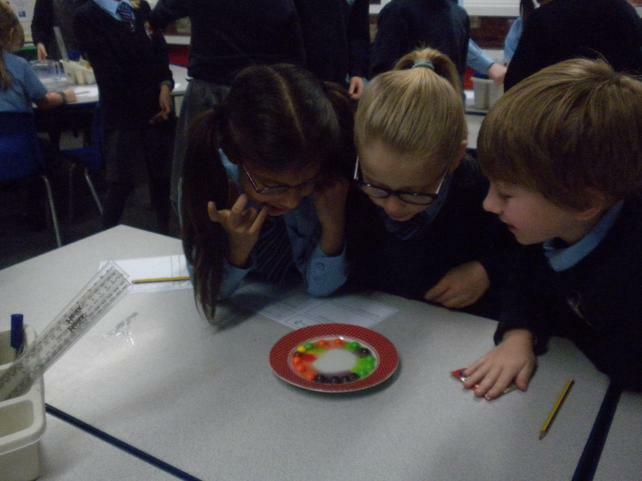 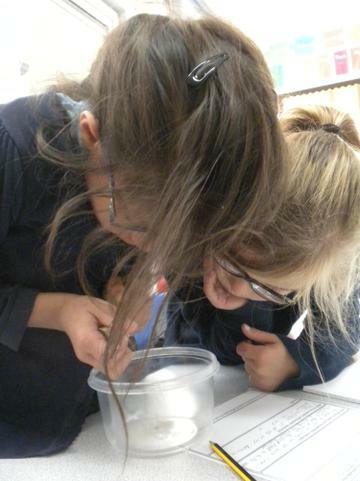 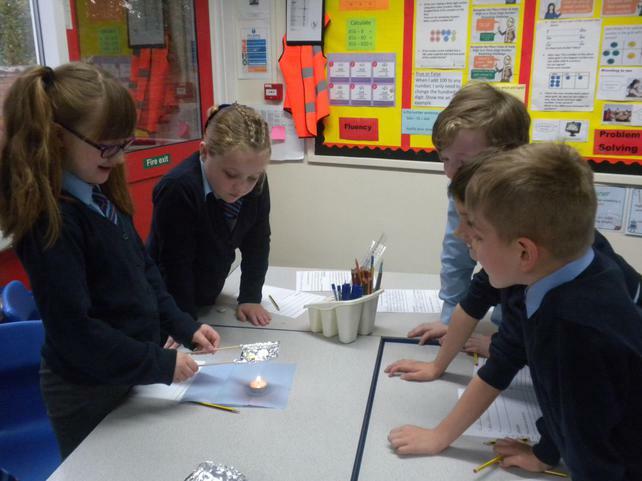 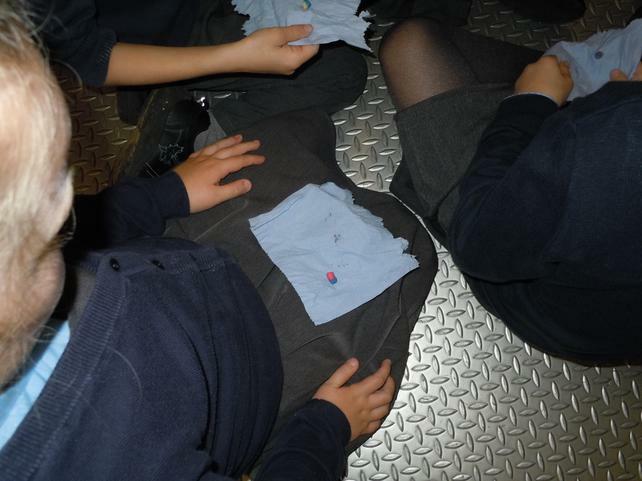 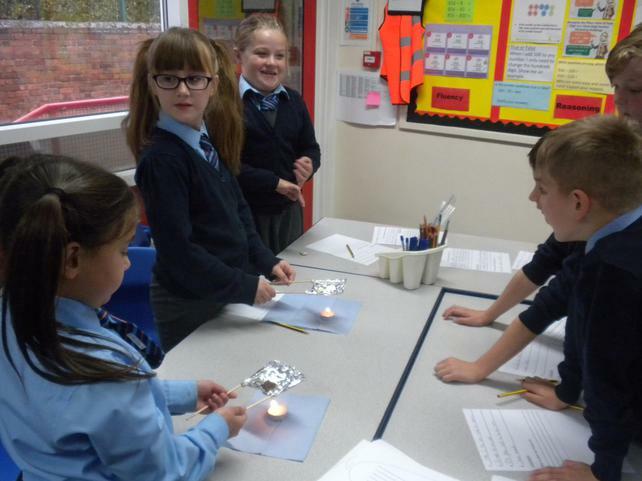 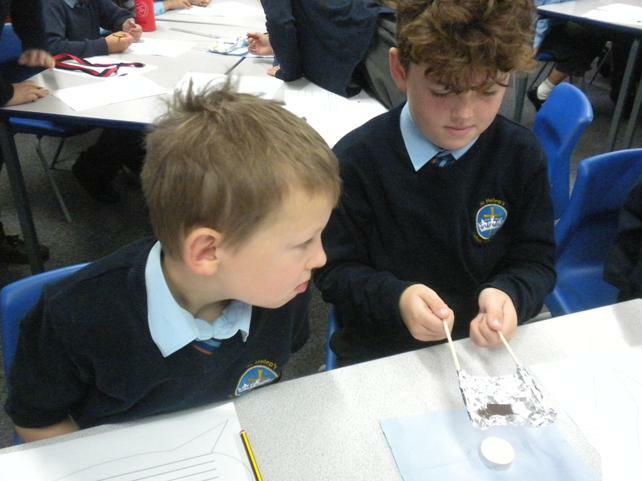 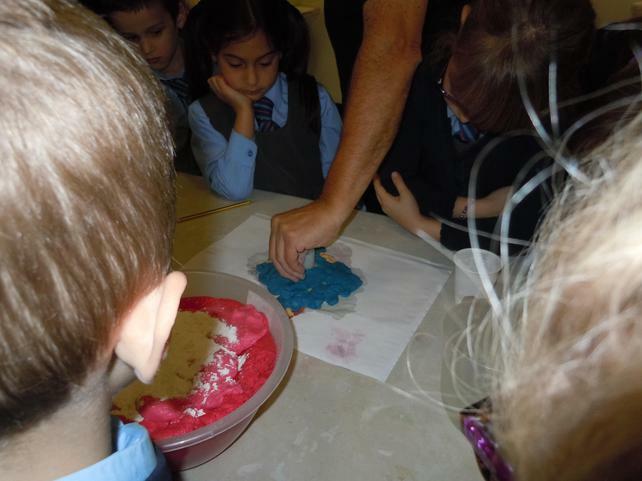 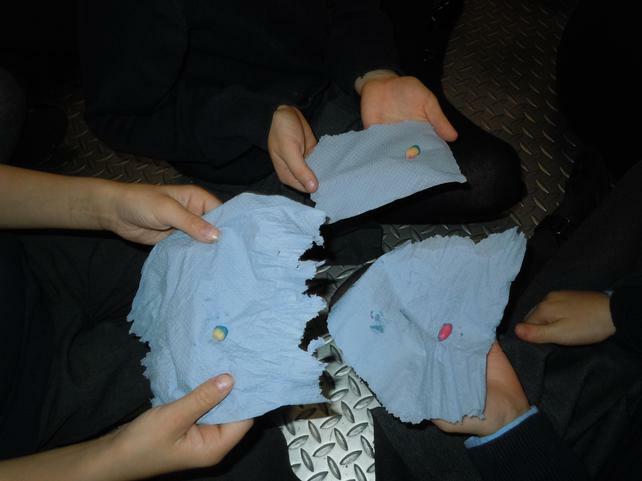 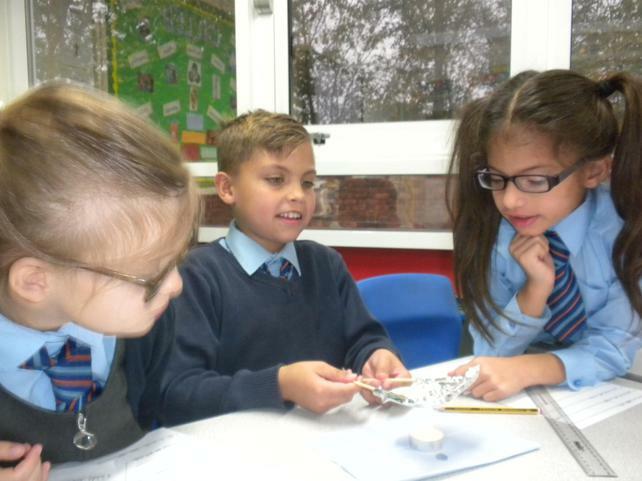 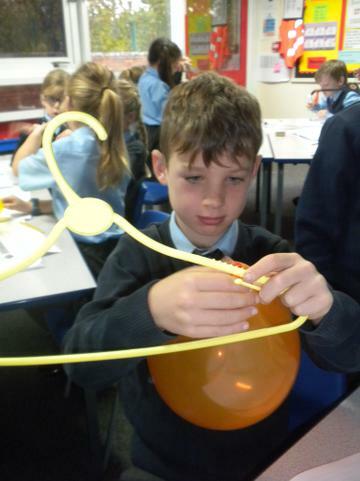 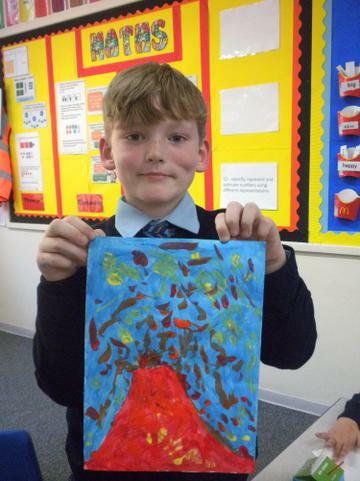 This week we have learnt all about the features of volcanos and what happens when they erupt. 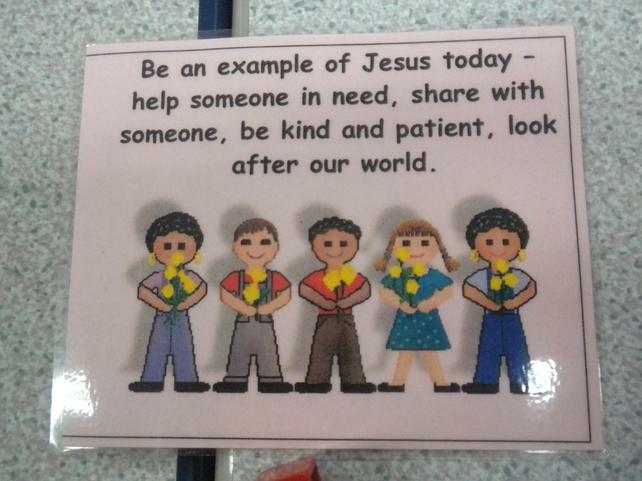 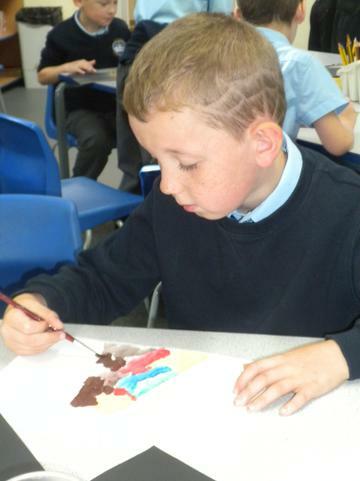 In RE we have been reading about Jacob and his sons Esau and Isaac. 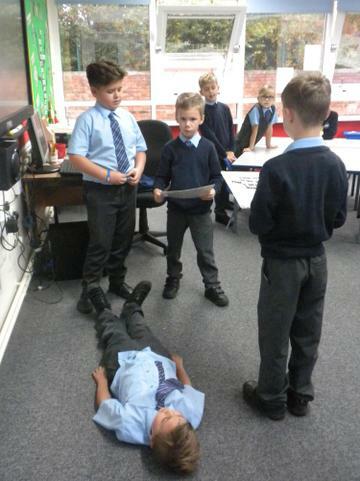 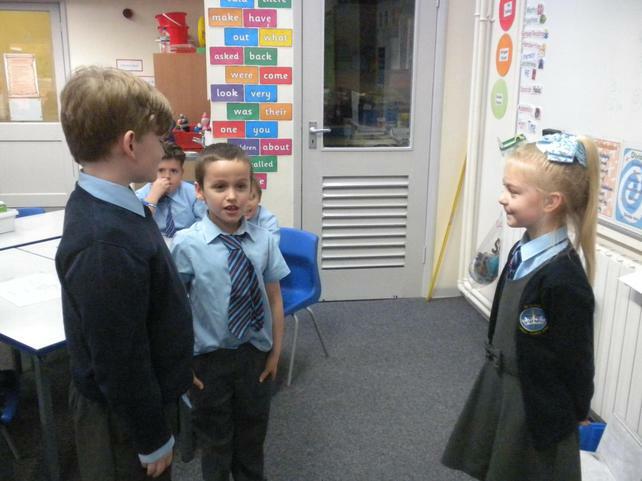 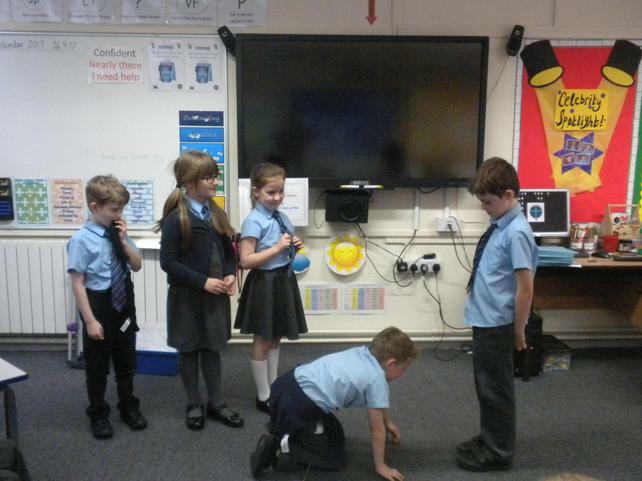 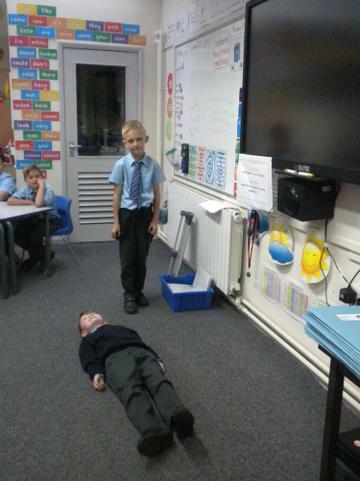 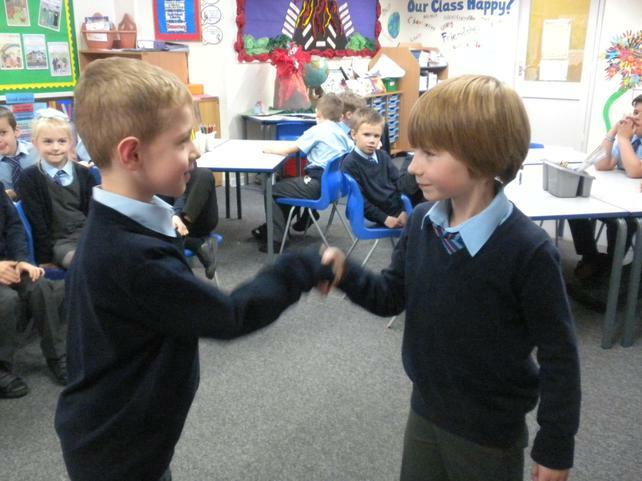 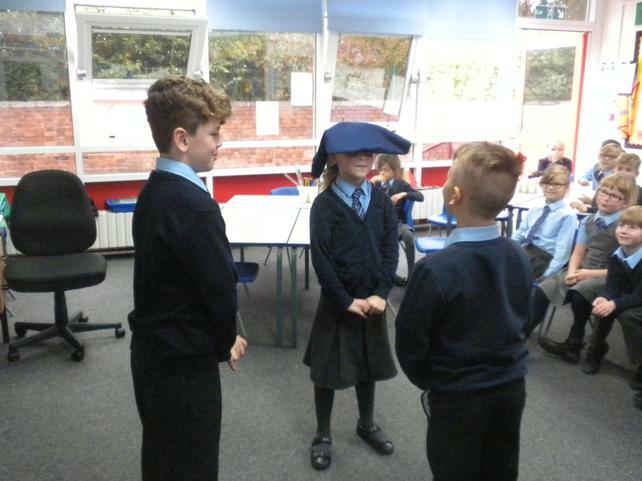 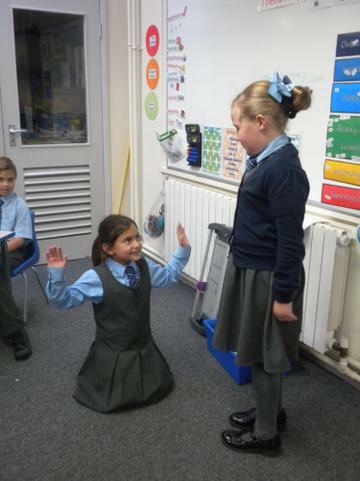 We then went onto perform a class play which was great fun. 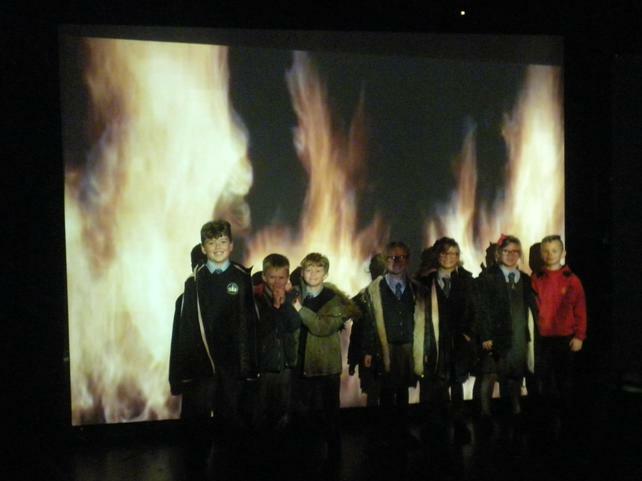 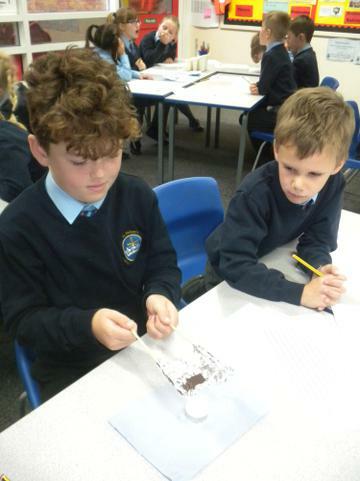 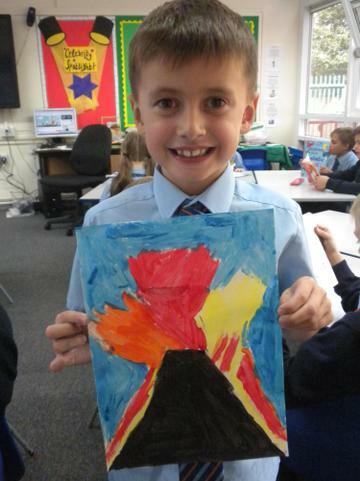 This week we have been finding out about the events of Pompeii and what happened when Vesuvius erupted in 79AD. 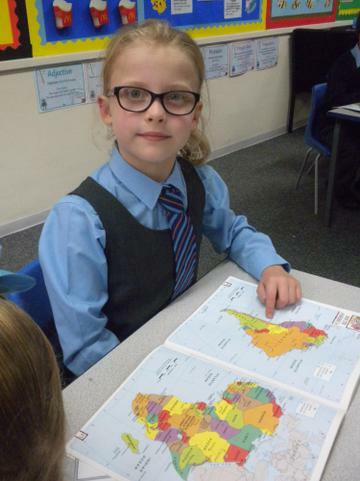 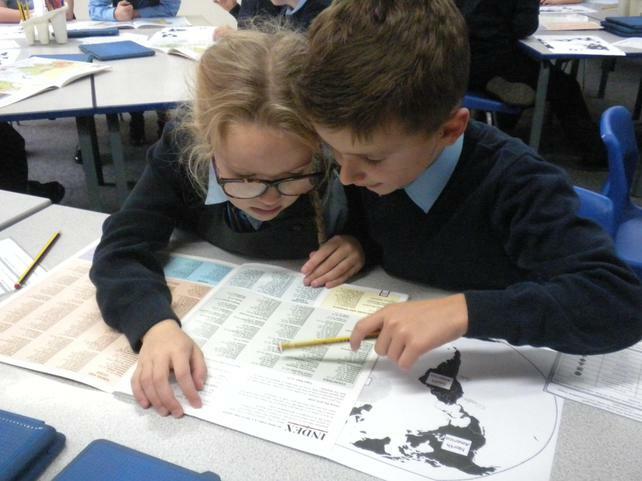 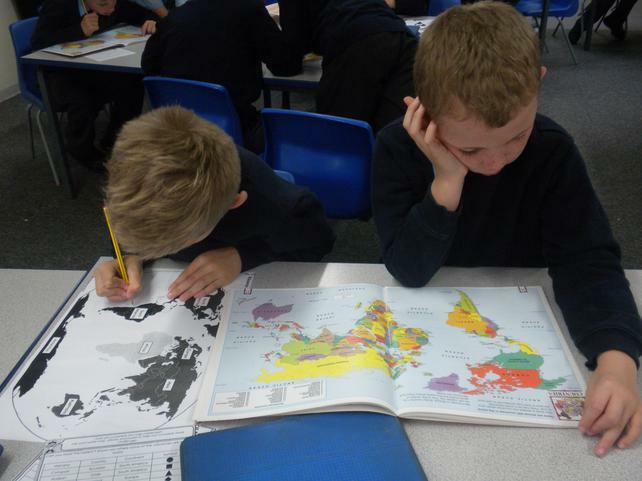 We then completed a map challenge and using the atlases we found the worlds major volcanoes. 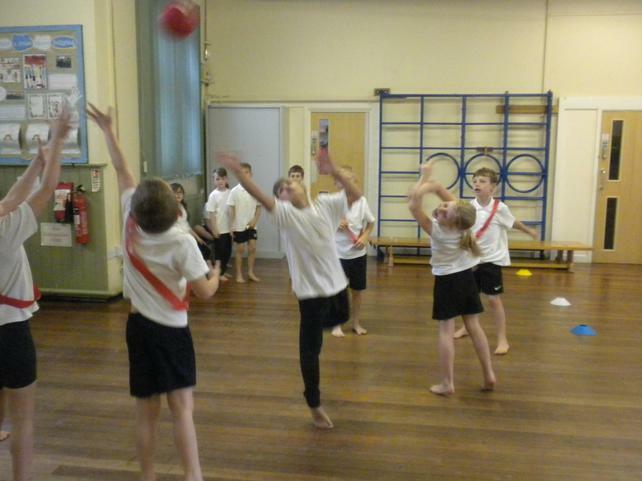 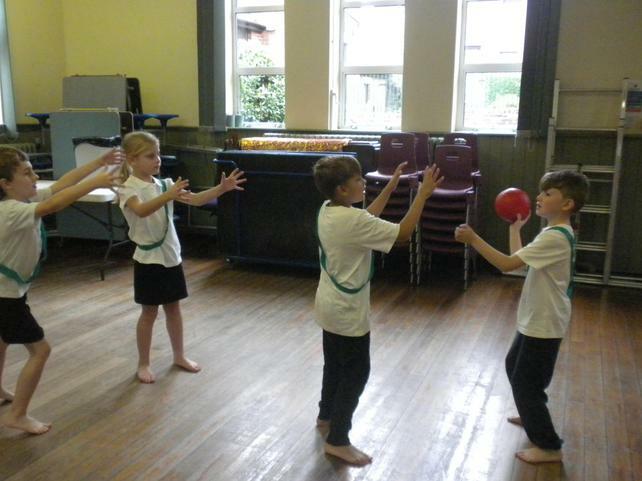 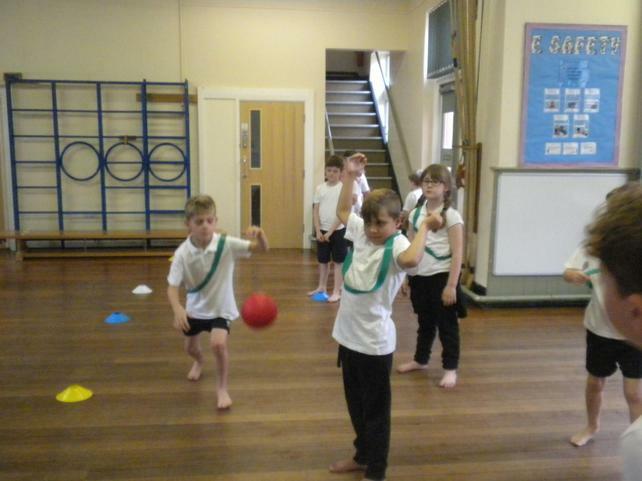 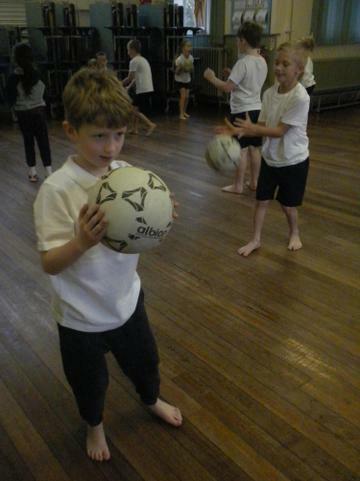 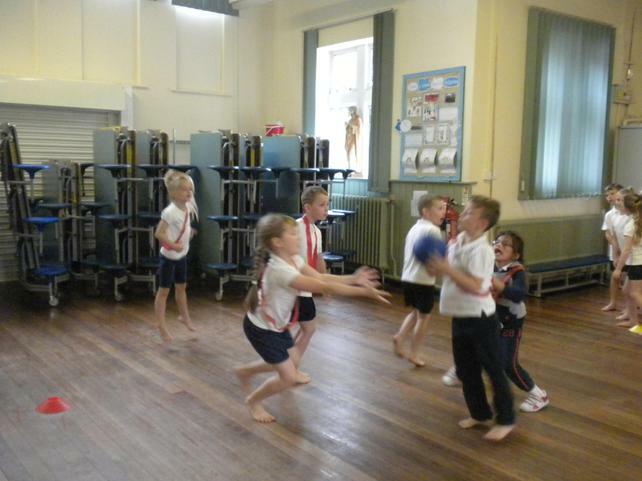 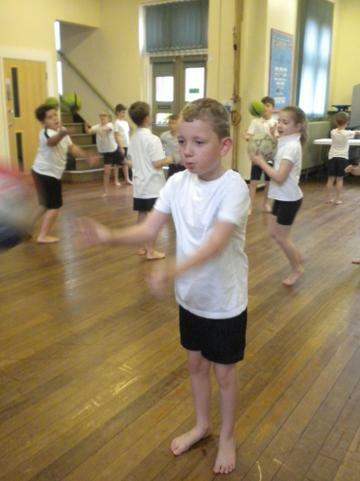 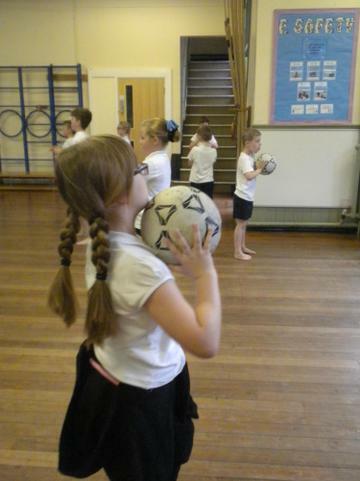 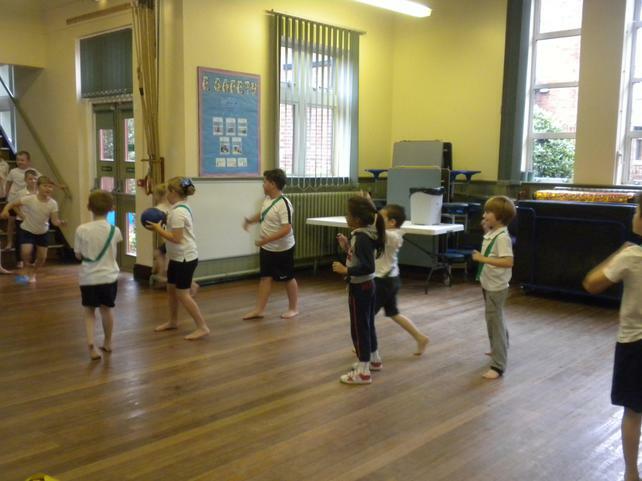 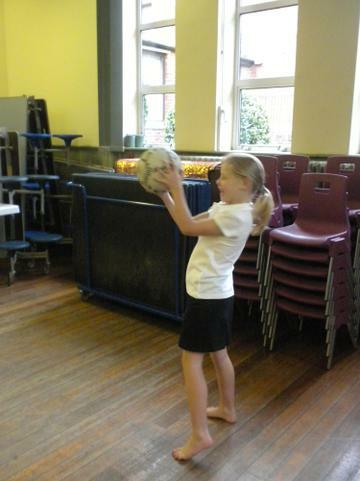 In PE we have been taking part in attack and defence games. 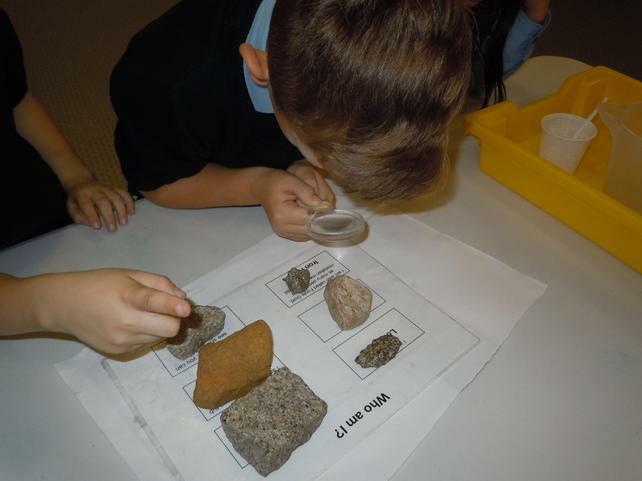 This week we have be learning about different kinds of rocks. 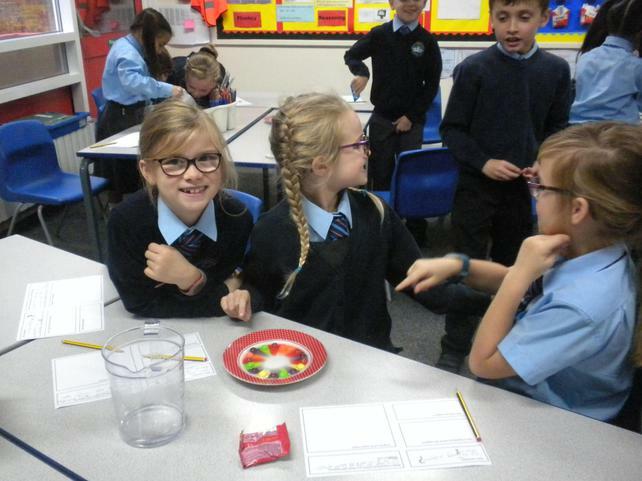 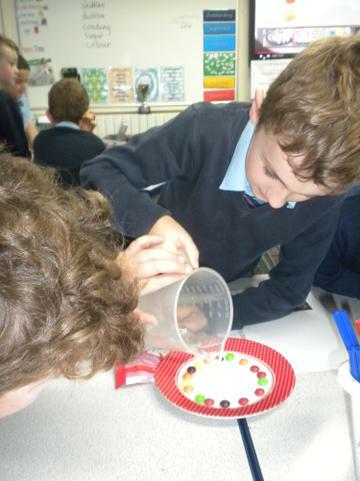 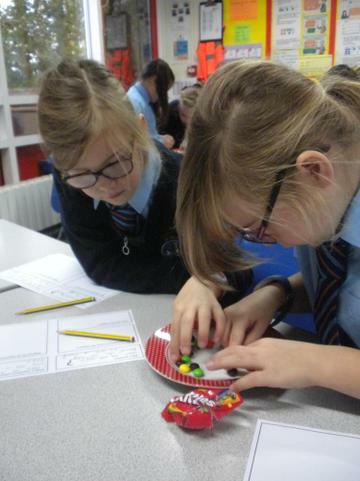 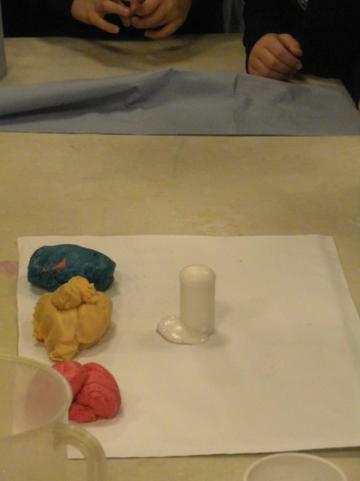 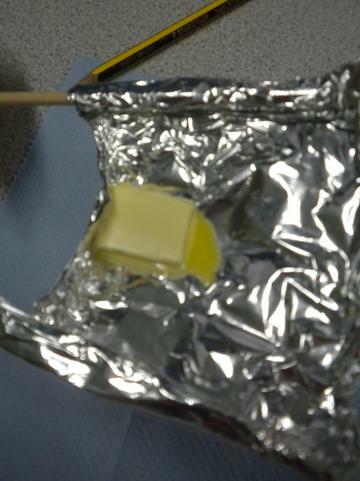 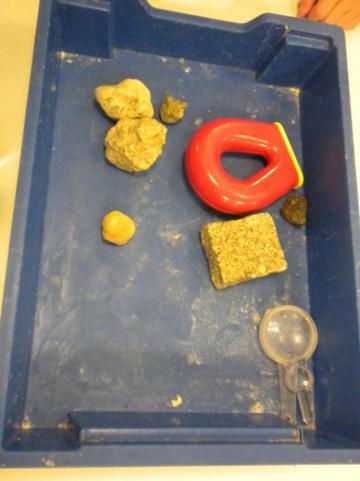 We planned an experiment to see which rocks would erode. 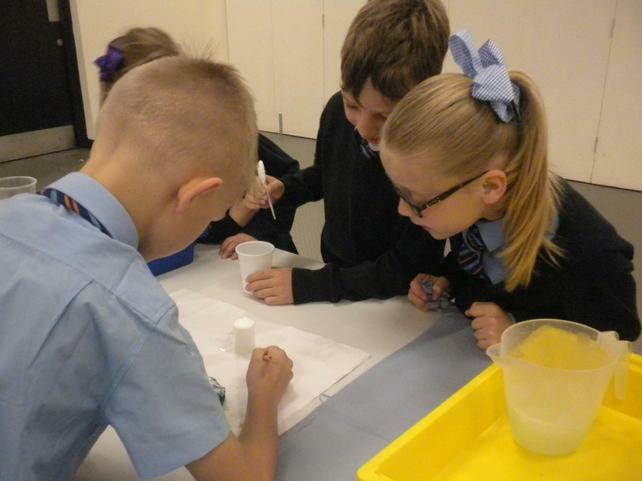 As scientist we had to decide how we would make the test fair and how we could record our results. 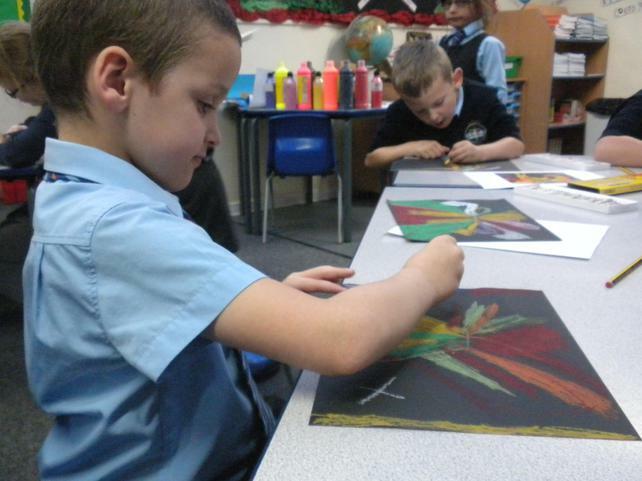 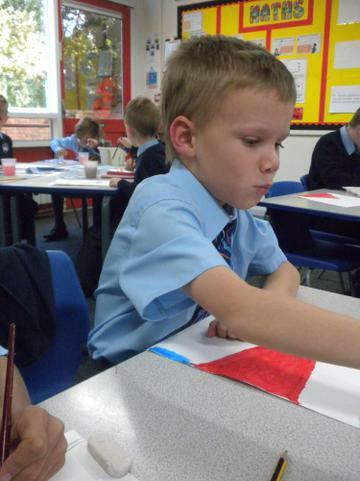 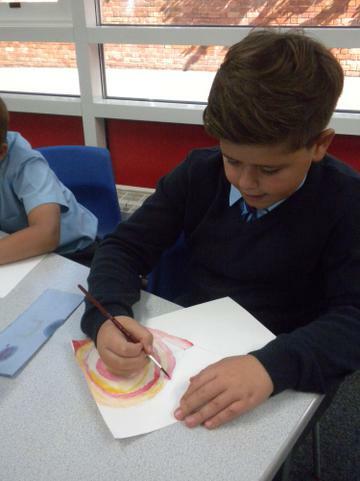 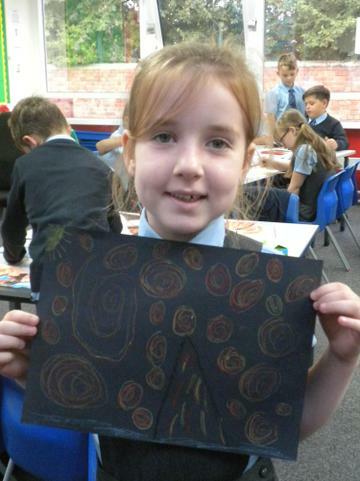 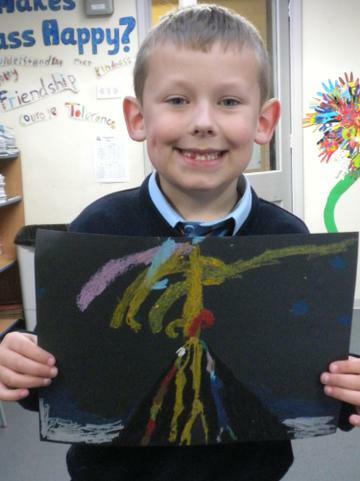 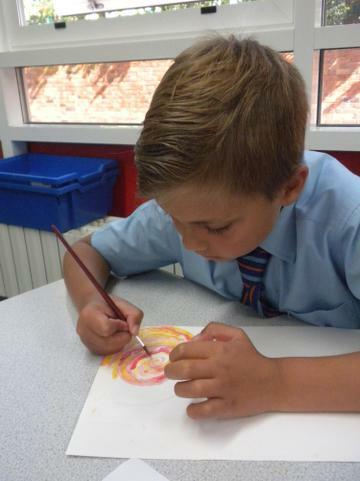 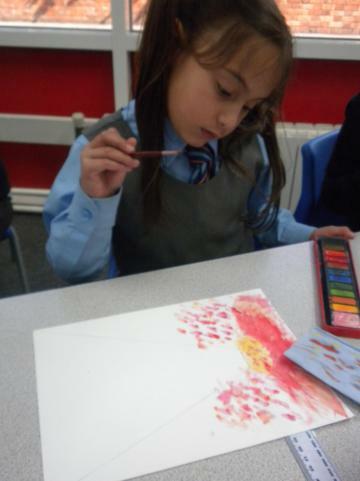 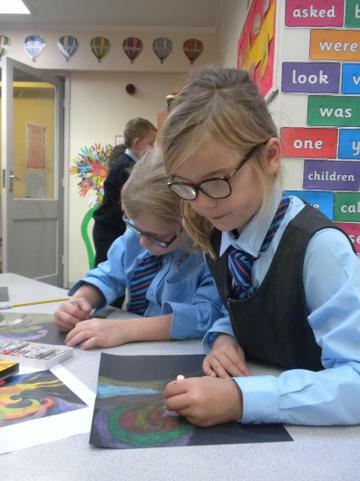 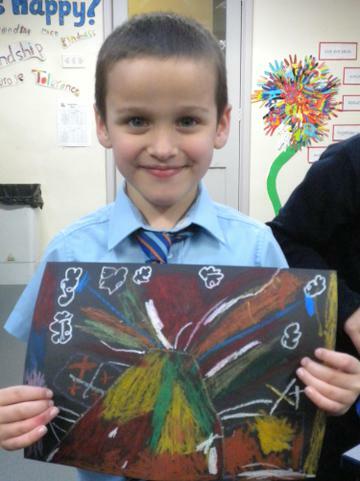 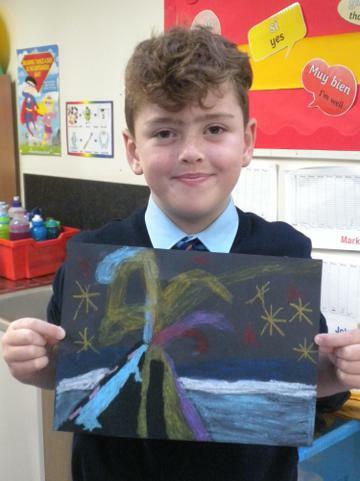 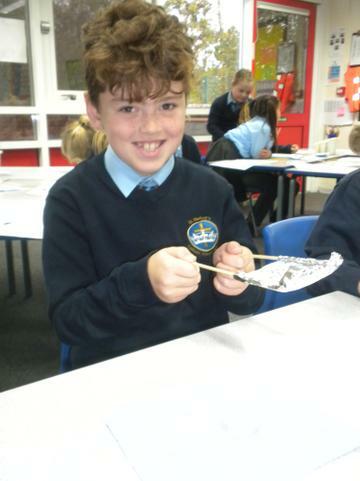 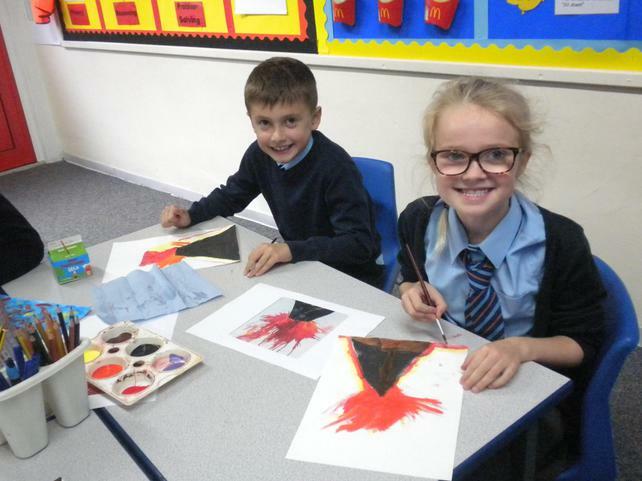 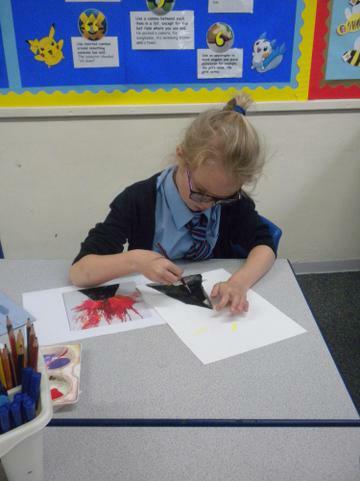 We have also been looking at volcano pictures in art and have created some wonderful designs. 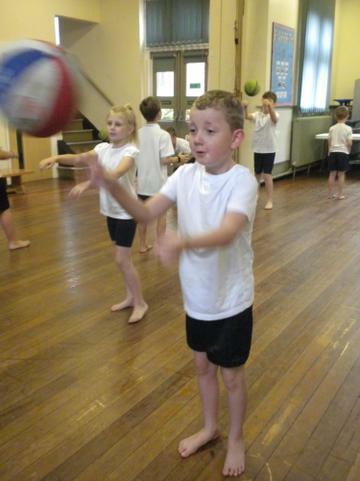 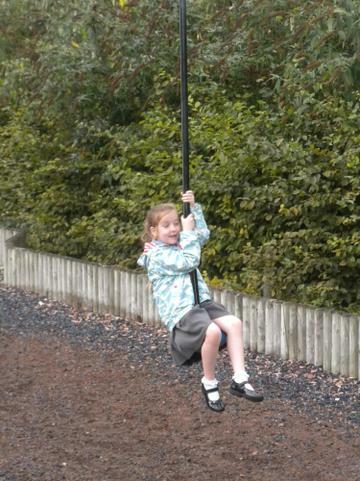 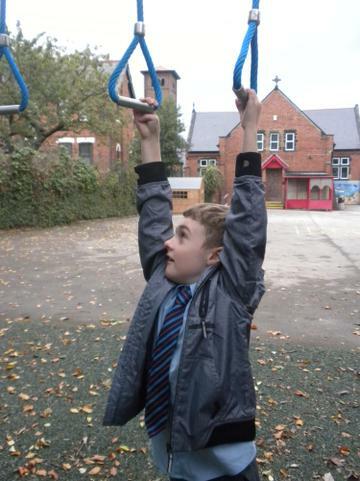 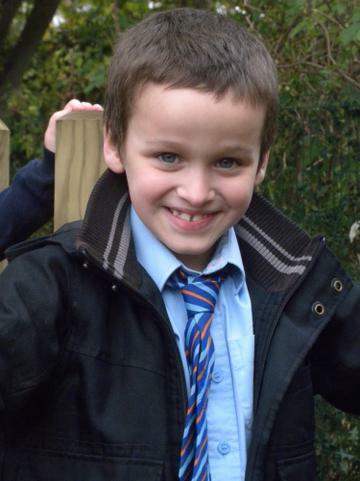 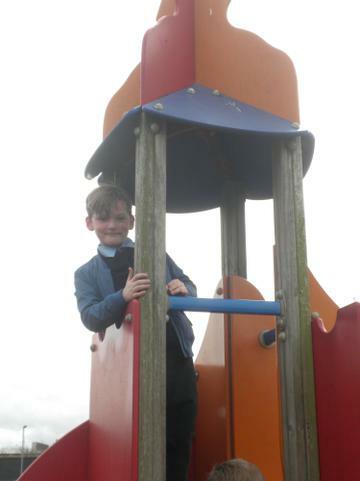 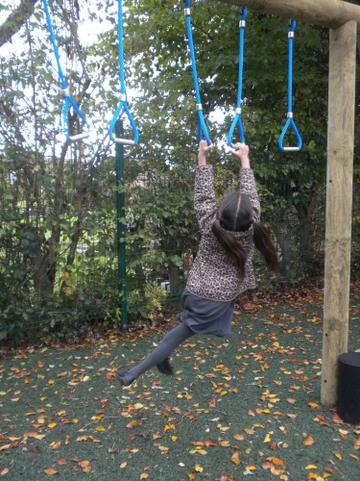 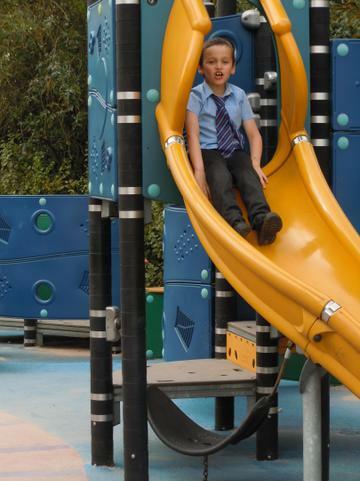 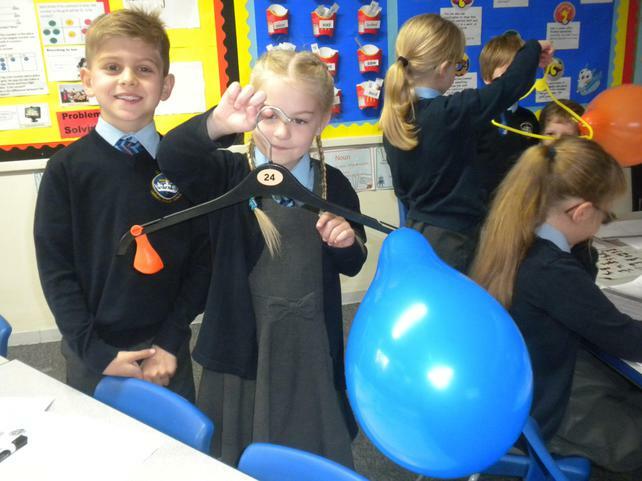 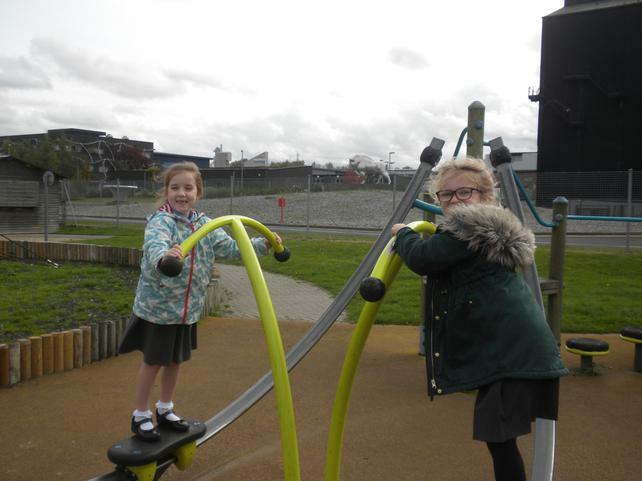 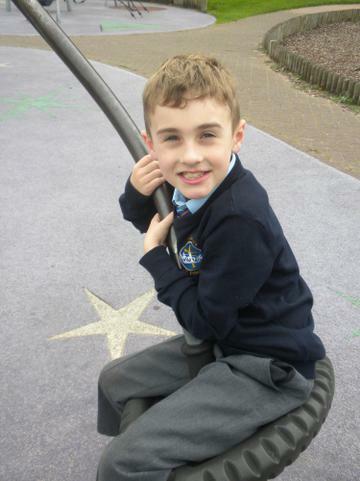 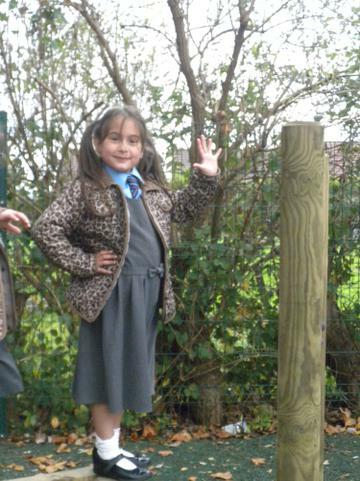 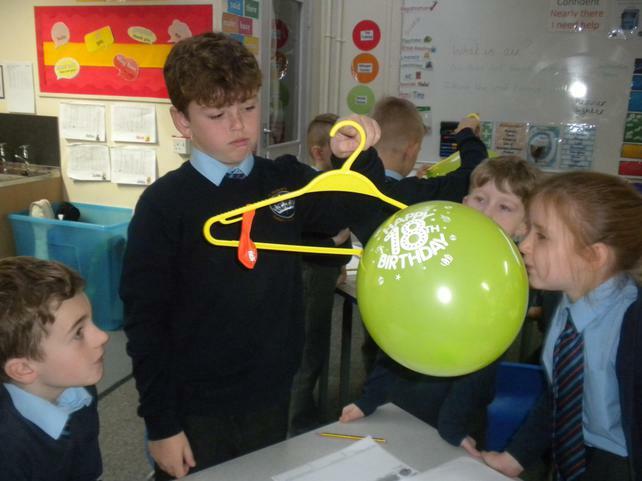 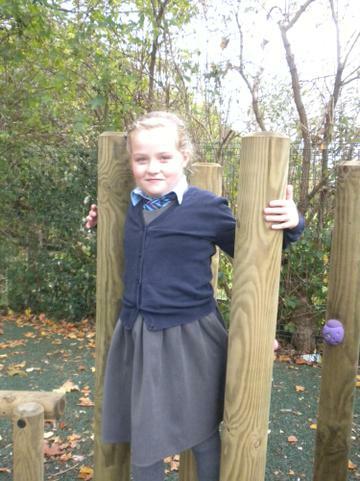 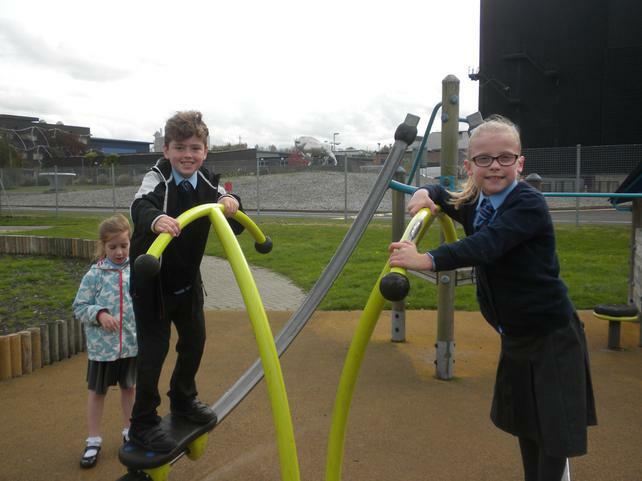 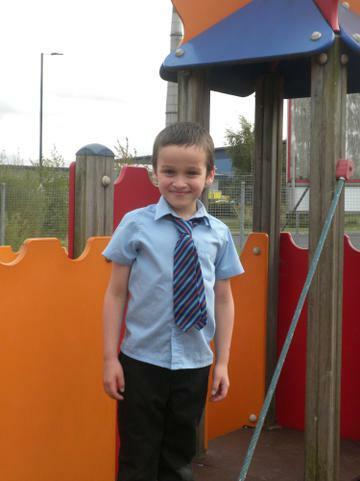 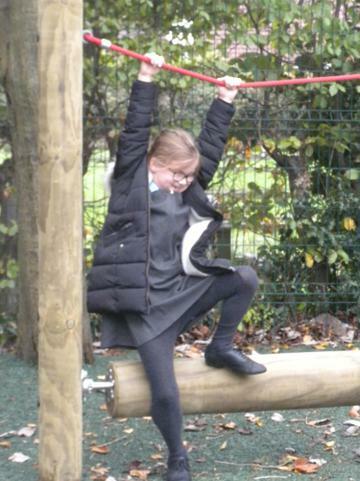 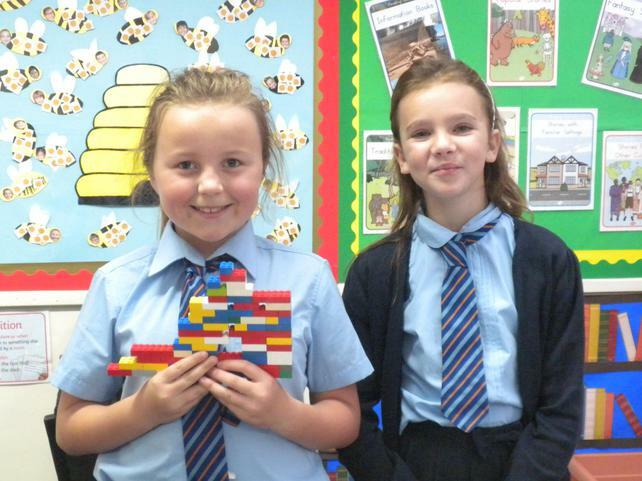 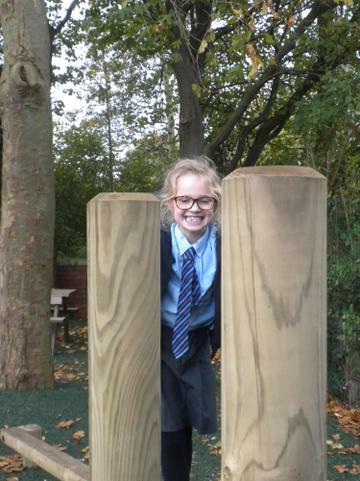 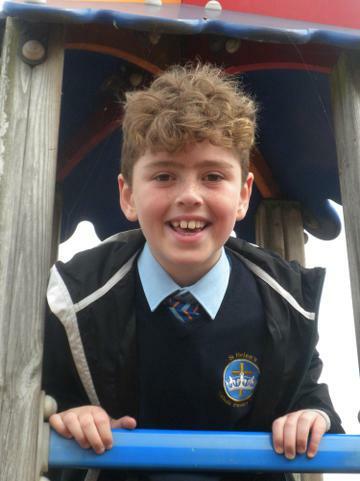 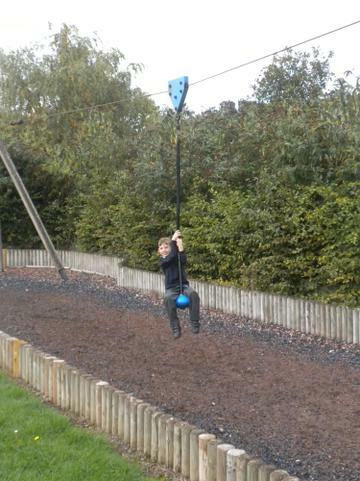 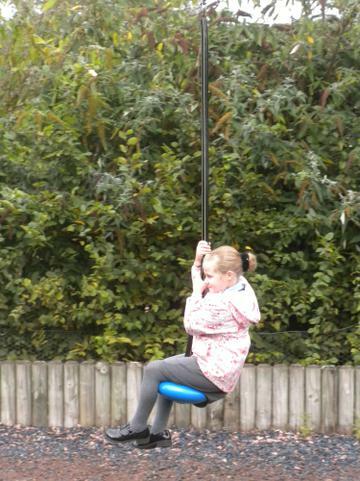 Class 3 has made a fantastic start to the new school year, full of energy and enthusiasm! 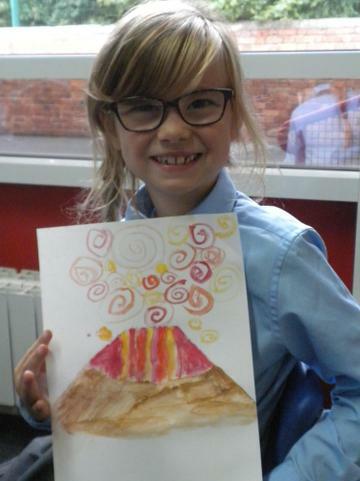 This week in maths we have been looking at place value and in literacy we have been exploring volcano poems. 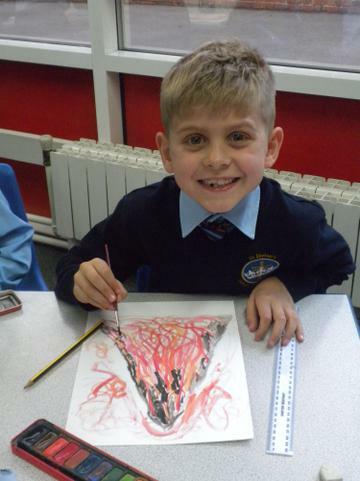 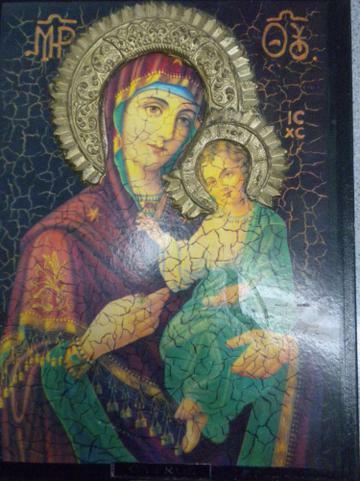 In RE we have been learning all about our family tree and making links with Jesus' family tree. 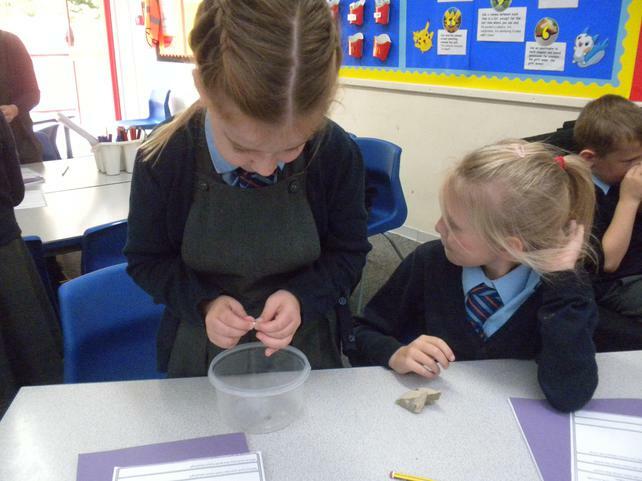 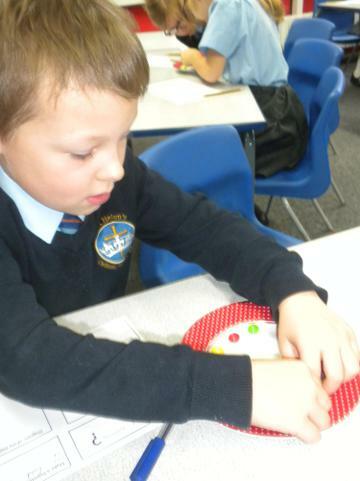 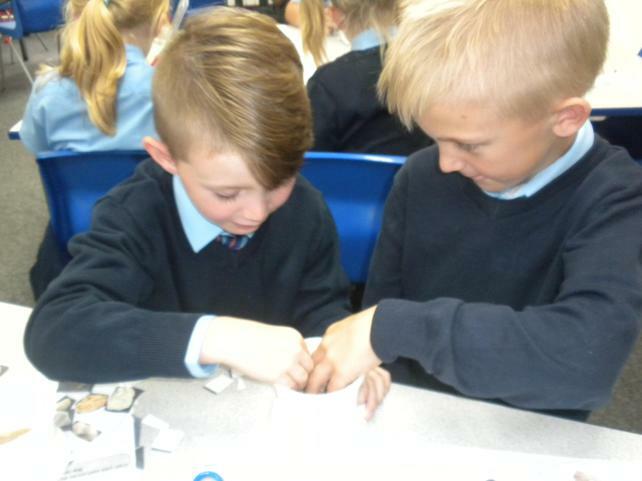 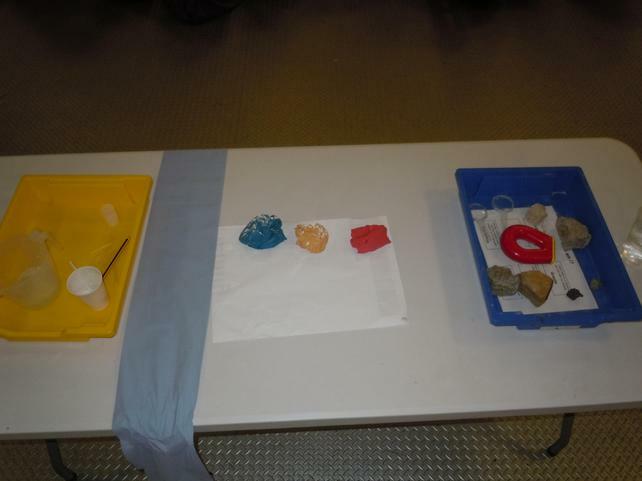 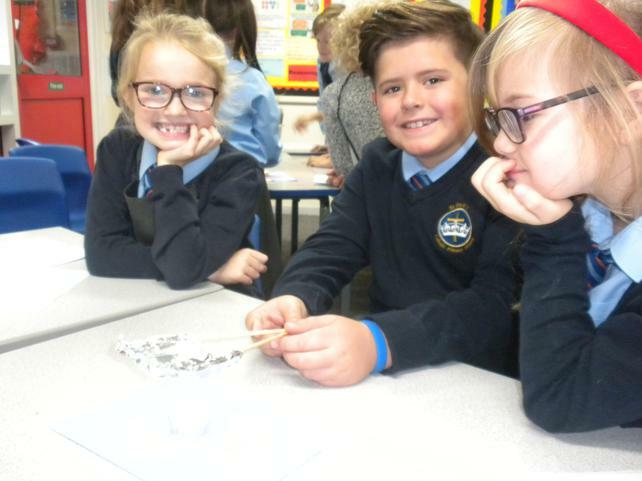 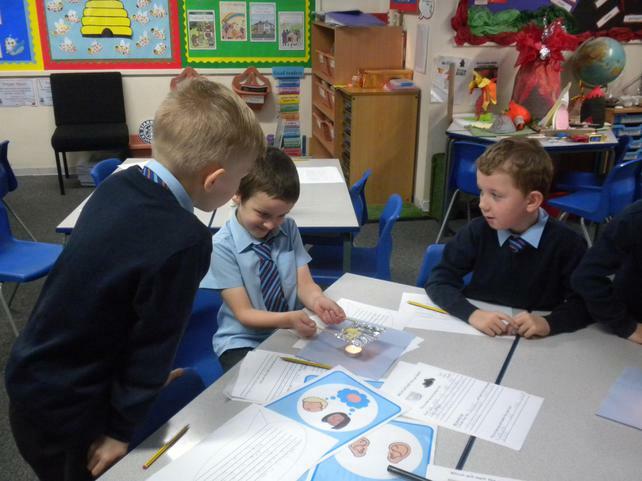 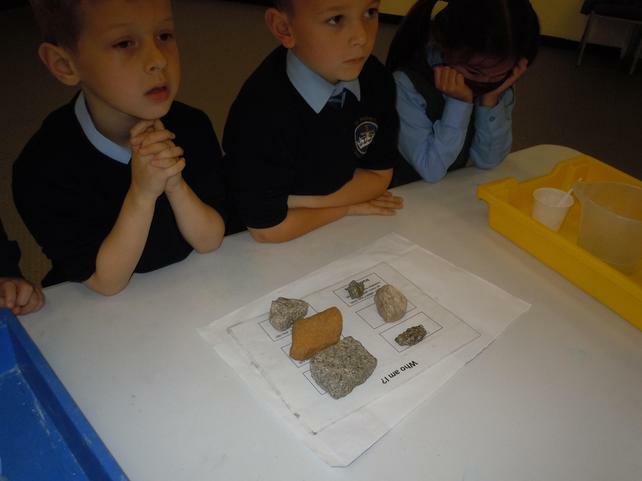 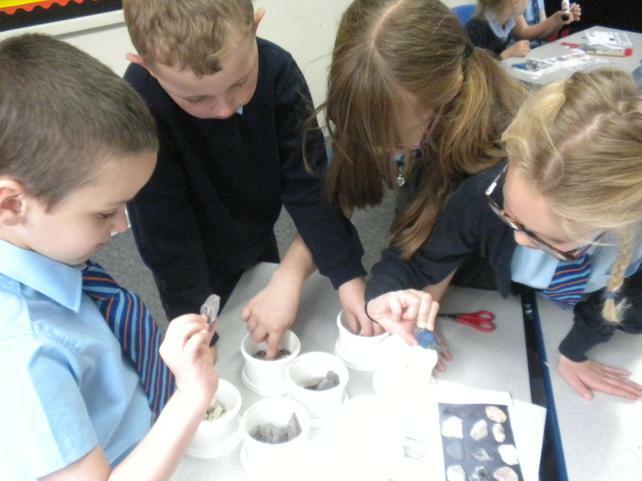 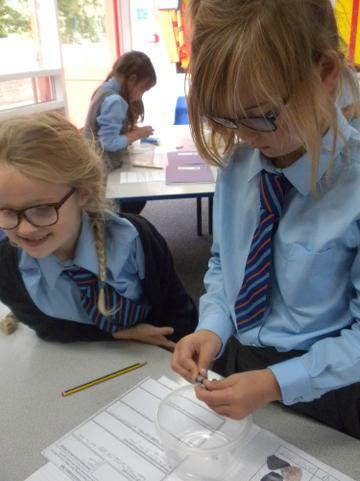 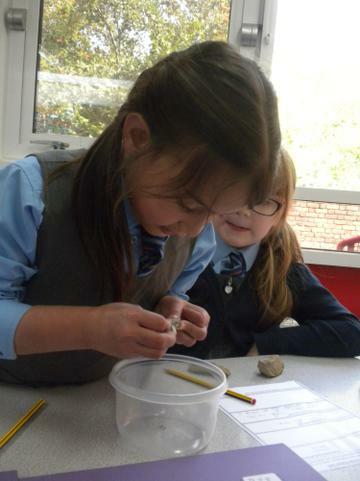 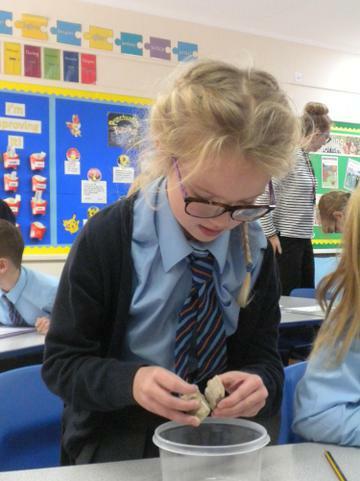 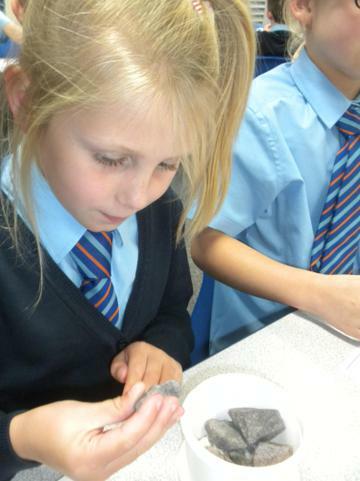 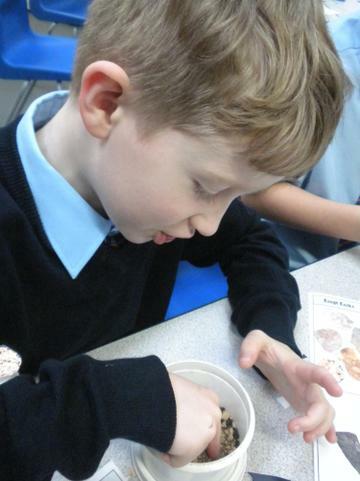 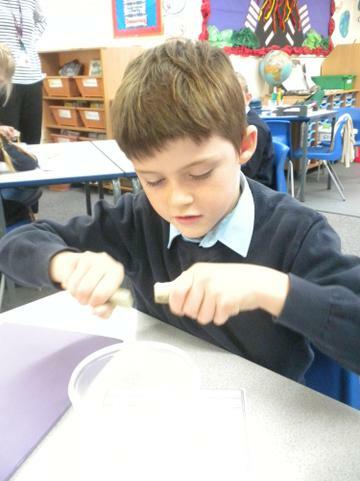 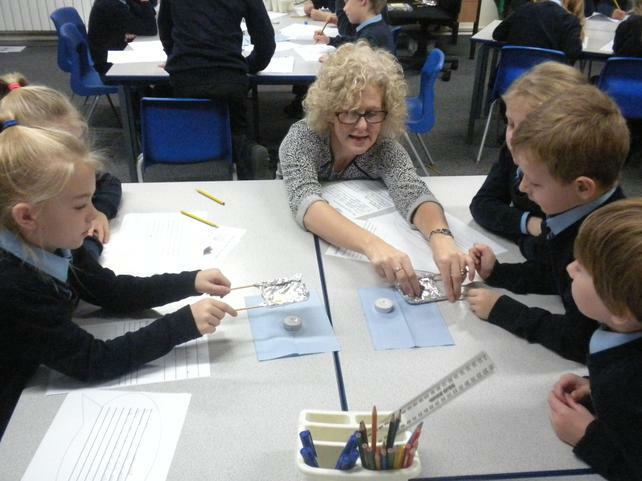 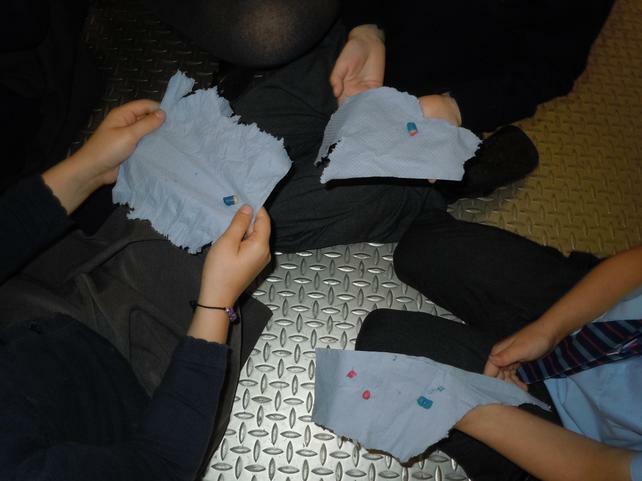 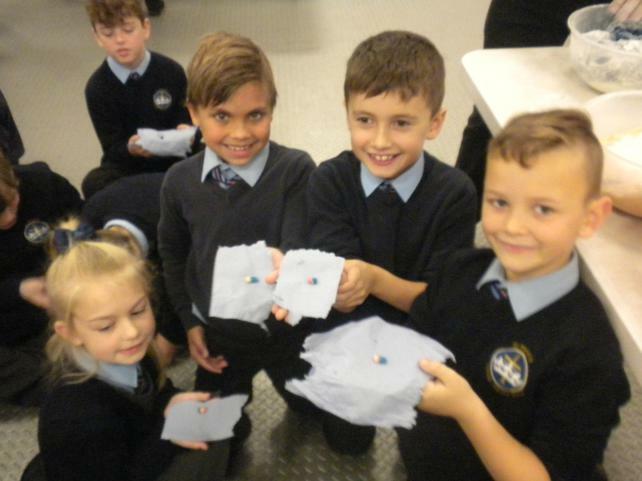 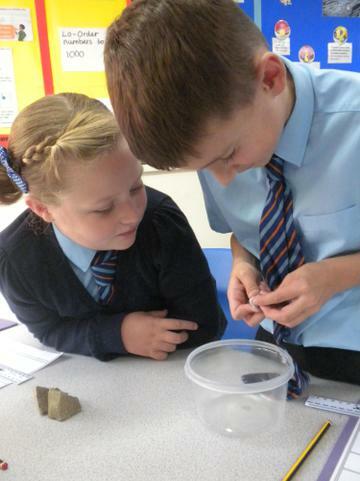 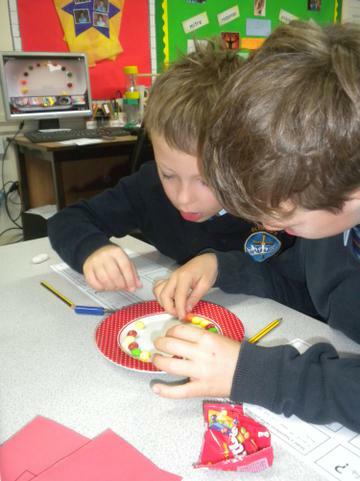 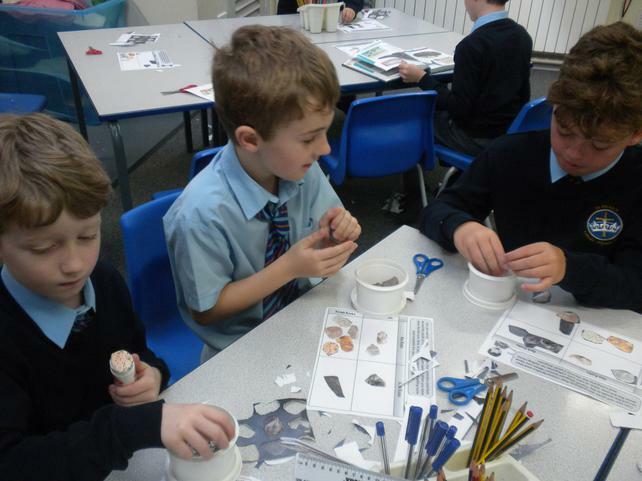 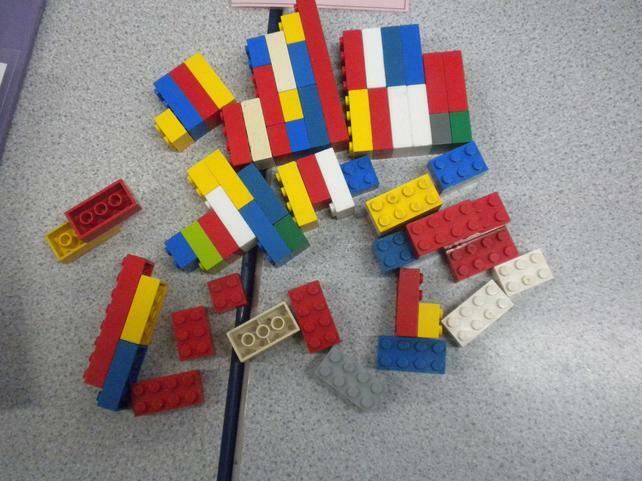 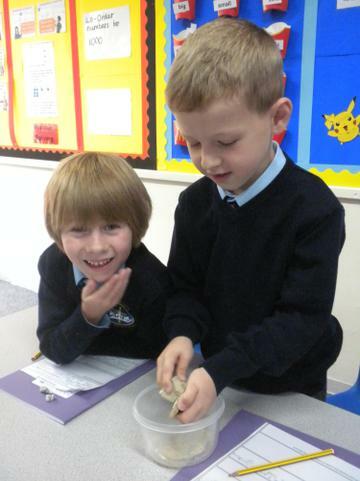 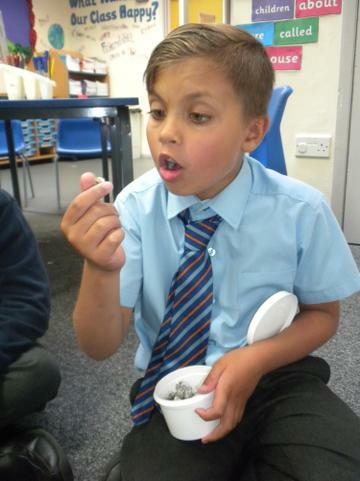 Our topic lesson has been all about different rocks and we have been sorting them into two groups, man-made or natural.